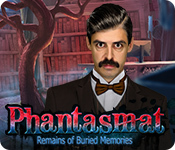 September 1st, 2016 by Big Fish Games in Walkthroughs. 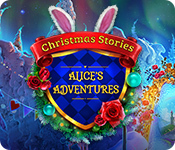 Welcome to the Bridge to Another World: Alice in Shadowland Walkthrough. 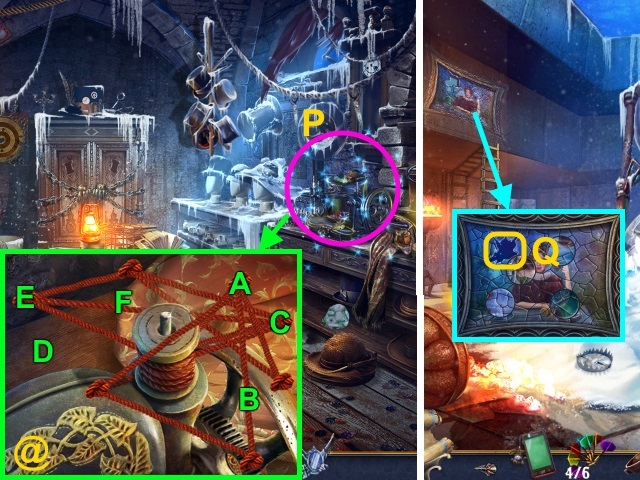 This document contains a complete Bridge to Another World: Alice in Shadowland game walkthrough featuring annotated screenshots from actual gameplay! 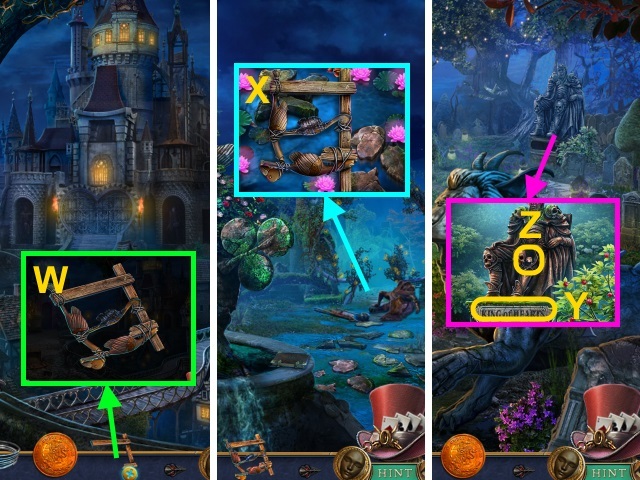 This is the official guide for Bridge to Another World: Alice in Shadowland. Examine the laces 3x; take the SHOE (B). 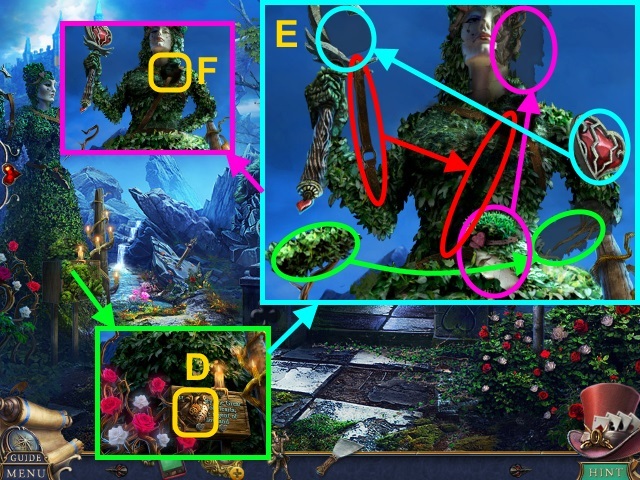 Read the note (C); move the leaves (D). Take the DIRTY PHONE (E). 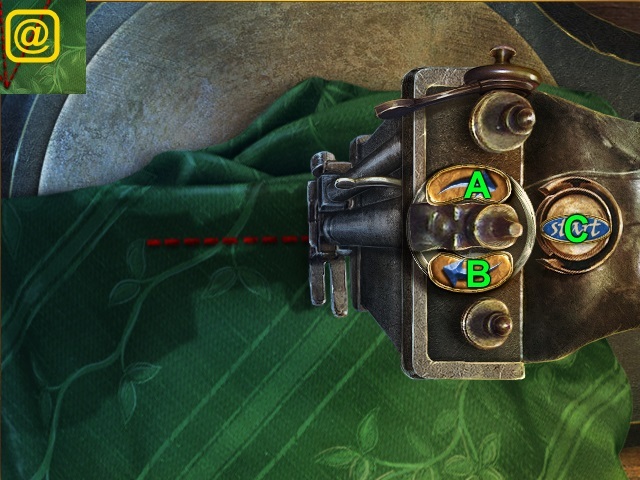 Combine the DIRTY PHONE and HANDKERCHIEF (F); press the button (G). Take the PHONE. Use the PHONE; press the button (H). Examine your arm 3x (J). Talk to Rabbitson (K); receive the SEARCHING COMPASS. 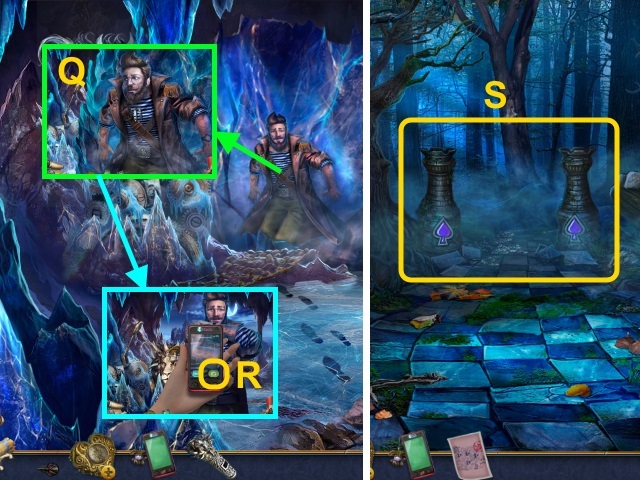 Examine the SEARCHING COMPASS; read the note (L). 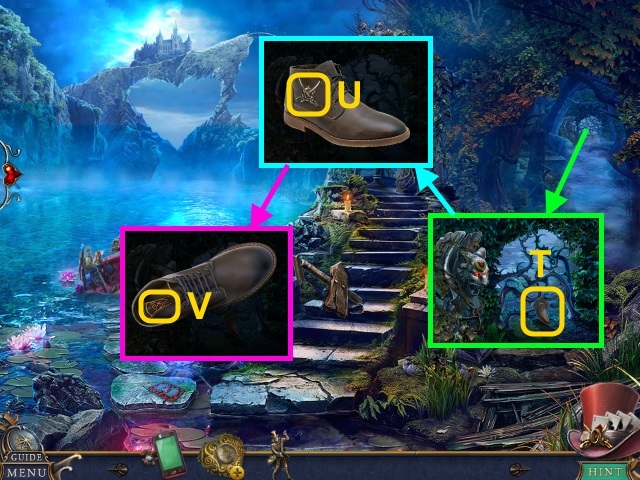 Open the compass; use the SHOE for a mini-game (M). 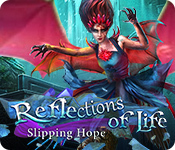 Play the HOP; receive the CRUSHED MIRROR SHARD (O). 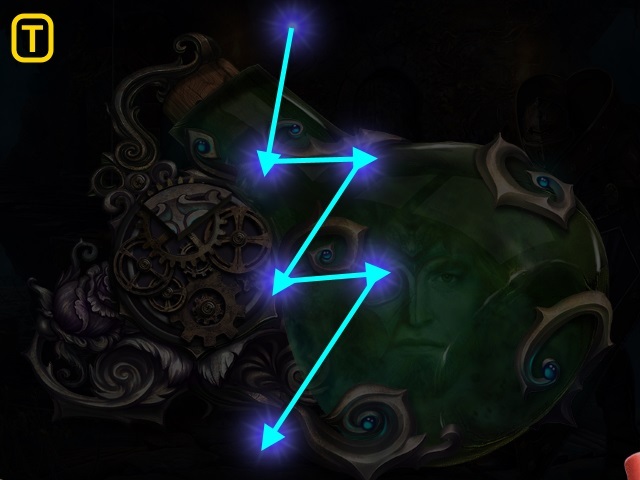 Give the CRUSHED MIRROR SHARD (P). 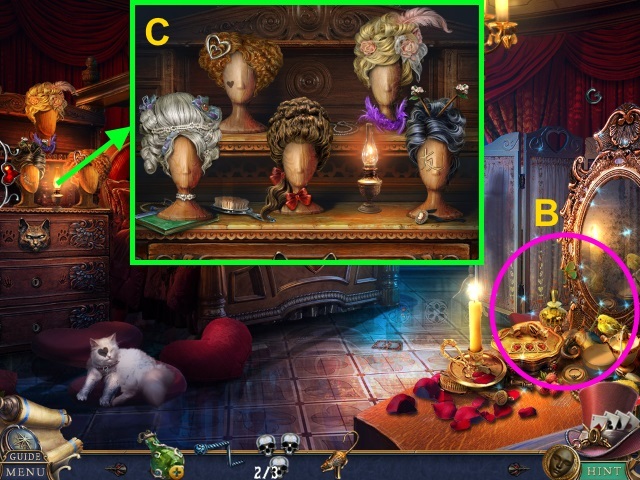 Press the button; take the HATTER FIGURINE (R). 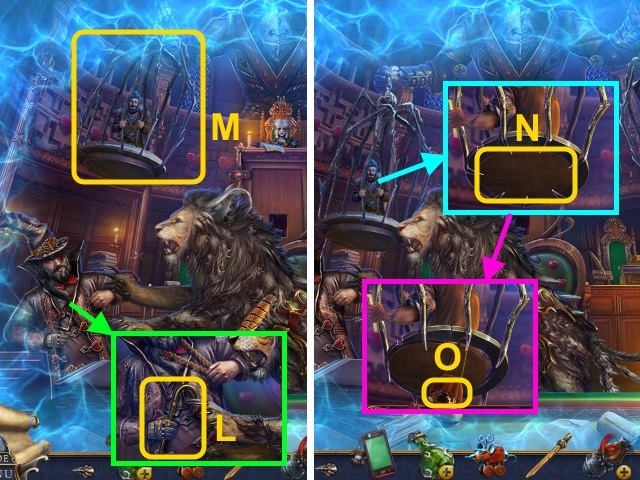 Play the mini-game; solution (S). 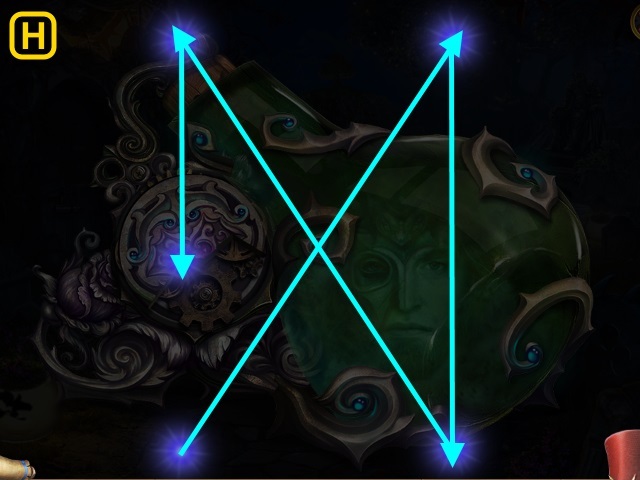 Take the ORDER SYMBOL (U). Turn the boot; take the SCRAPER (V). 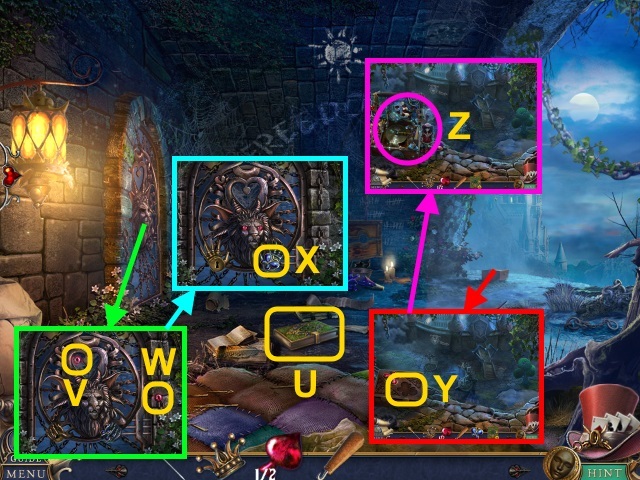 Place the ORDER SYMBOL (X); open the book for a mini-game (Y). Take the GARDEN SHEARS (A). Use the GARDEN SHEARS (B). 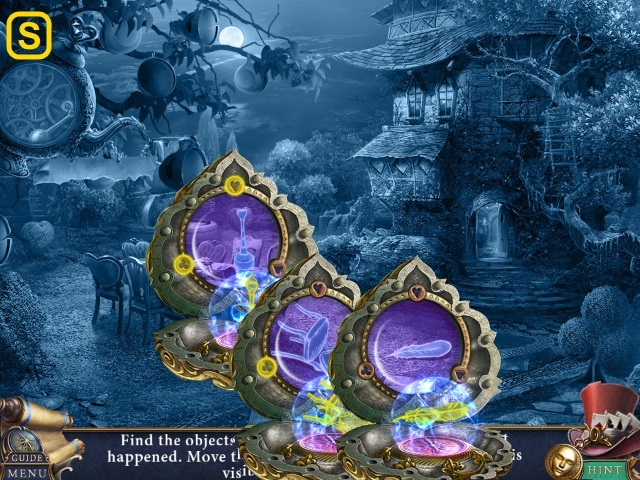 Use the SCRAPER 3x; take the STATUE’S HEART (D). 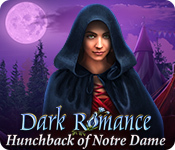 Place the STATUE’S HEART (F). Take the METAL SCEPTER (G). Examine the paper (H); take the NAIL (1/6) (I). 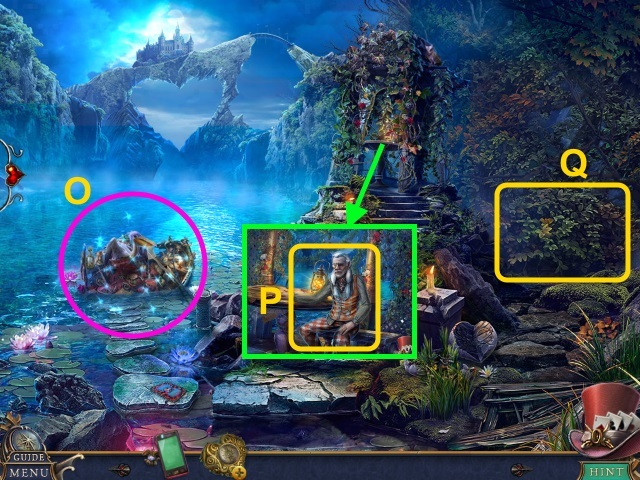 Use the METAL SCEPTER; take the HATTER FIGURINE (J). 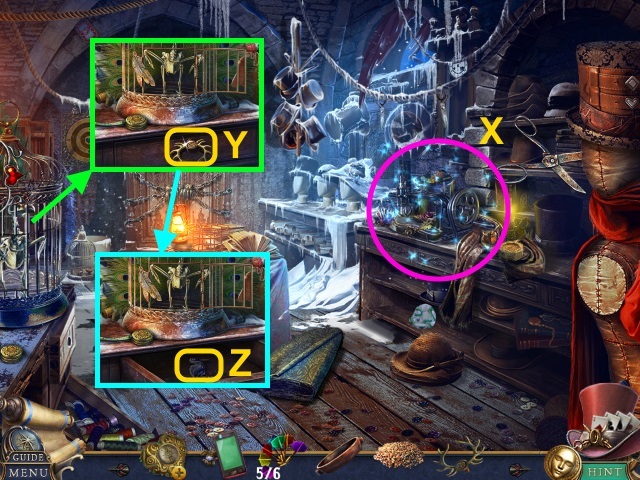 Examine the paper; use the 2 HATTER FIGURINES (K). 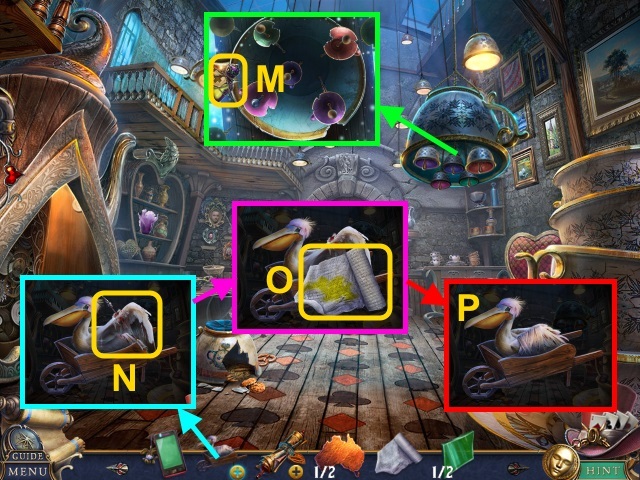 Examine the paper for a mini-game (L). 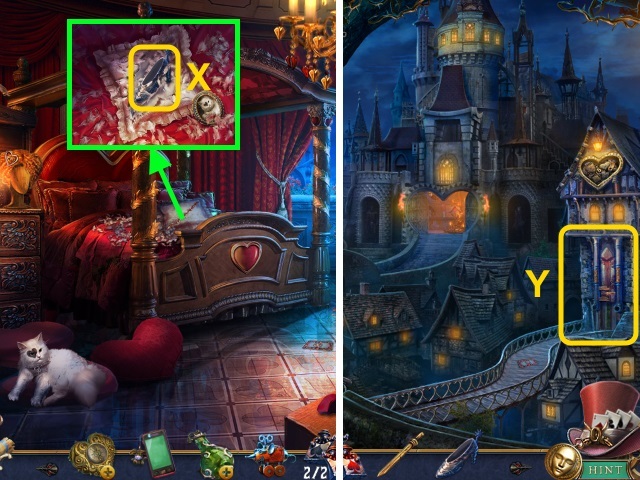 Take the HAMMER (R); examine the posters (S). Take the NAILS (2/6) (T). 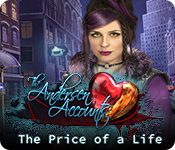 Examine the scene; take the BROKEN LADDER (U). Take the SIGN (1/3) (W). Use the PHONE (X); press the button (Y). Receive the HORSE-STATUE PICTURE. 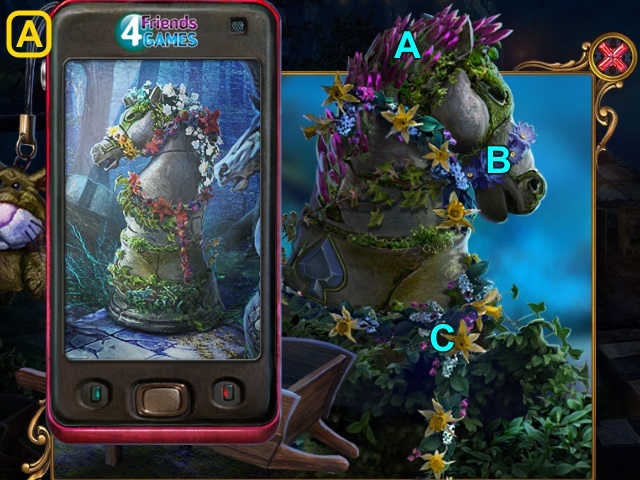 Examine the note (Z); place the HORSE-STATUE PICTURE for a mini-game. Use the SCREWDRIVER; take the SIGNS (2/3) (C). Take the HEART PIECE (D). Use the SCREWDRIVER (E); receive the SIGNS (3/3). 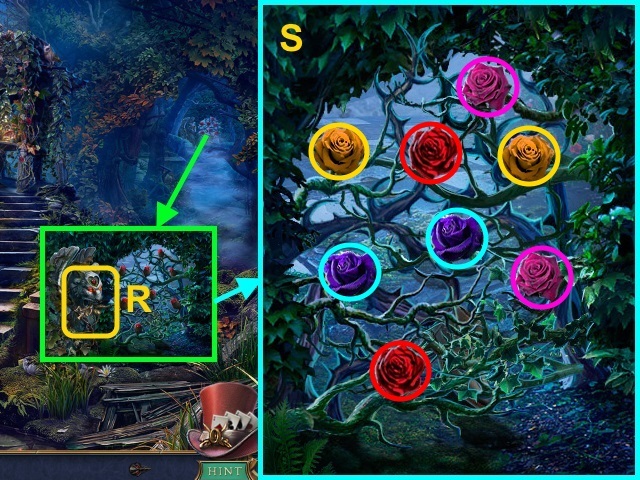 Place the HEART PIECE for a mini-game (F). Take the GREEN GEM (H). Examine the UMBRELLA; place the GREEN GEM (I). Open the umbrella; take the NAILS (3/6)-(6/6) (J). Combine the BROKEN LADDER and SIGNS (3/3) (K); place the signs. Use the NAILS (6/6) and HAMMER; take the LADDER (L). Place the LADDER (M); examine the basket (N). 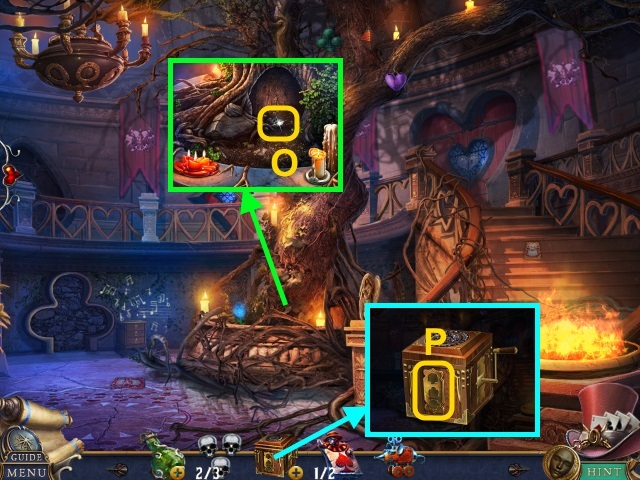 Move the items; collect the feathers (P-S). 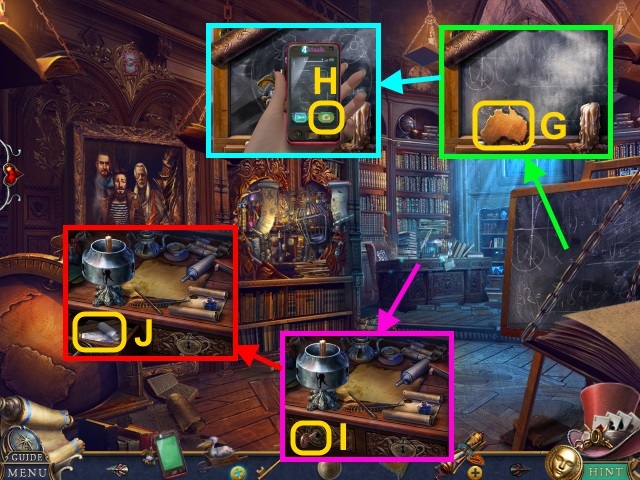 Take the TROWEL (T); examine the ribbon (U). Combine the MEGAPHONE and BRUSH (W); take the MEGAPHONE. Use the MEGAPHONE; take the MONOCLE (X). 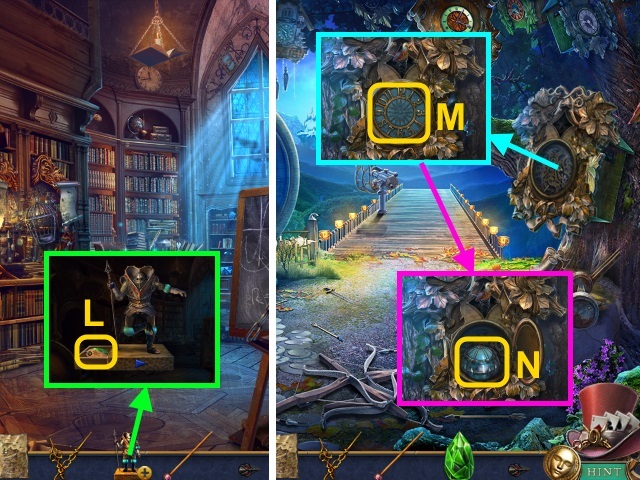 Combine the SEARCHING COMPASS and MONOCLE for a mini-game (Y). Use the TROWEL. Take the NET GUN; read the note (A). Use the NET GUN (C). 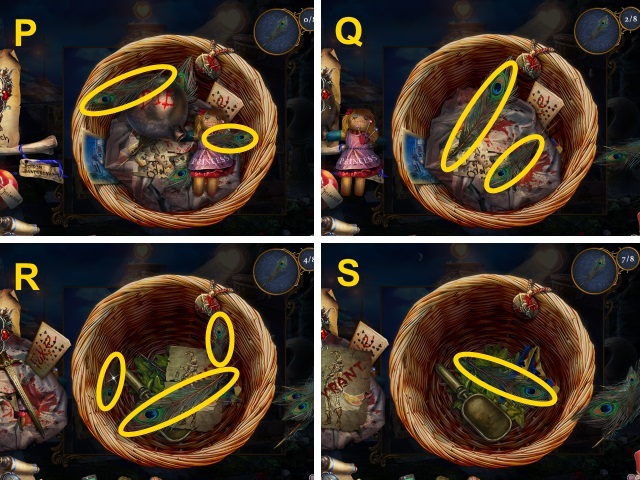 Examine the net for a mini-game (D). Use the PHONE; press the button (I). 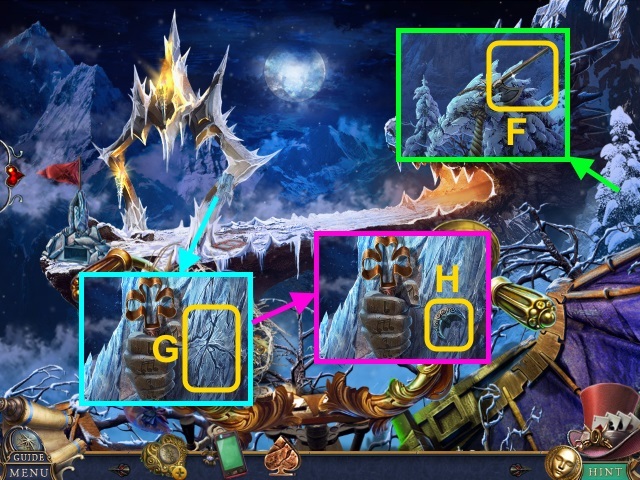 Play the HOP; receive the WINDING KEY (J). 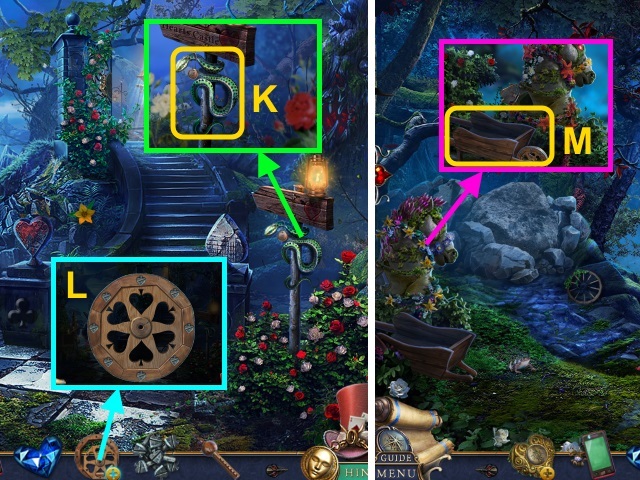 Examine the Watch (K); use the WINDING KEY (L). Use the WEIGHT; take the SHARP GLASS (N). Use the SHARP GLASS (O). 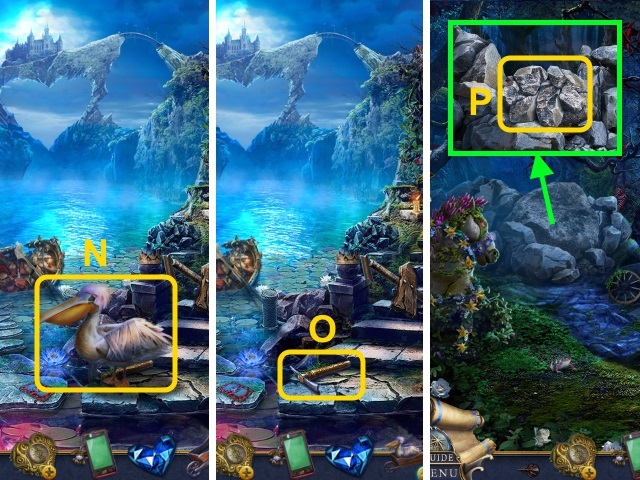 Move the plants 3x; examine the bats (P). Use the WEIGHT; take the JESTER-HAT FIGURINE (R). 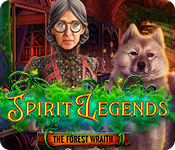 Use the AWL; take the SPADE GEM (1/2) (S). 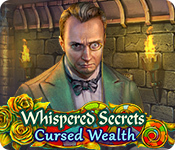 Examine the gate; gather the gems (V-W). Take the BUTTERFLY FIGURINE (X). Place the BUTTERFLY FIGURINE (Y). 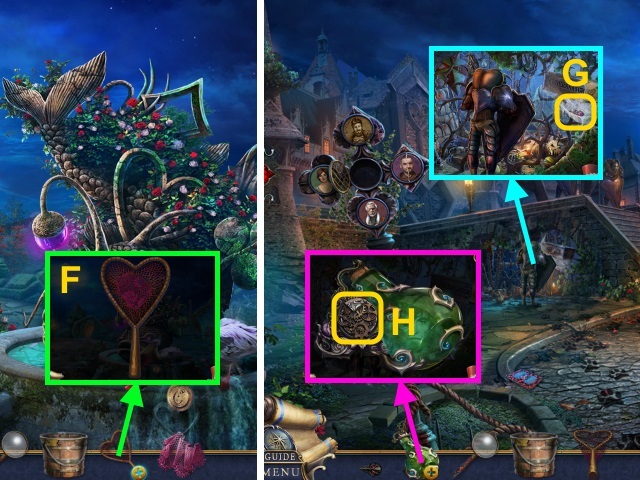 Play the HOP; receive the ‘A’ PENDANT (Z). 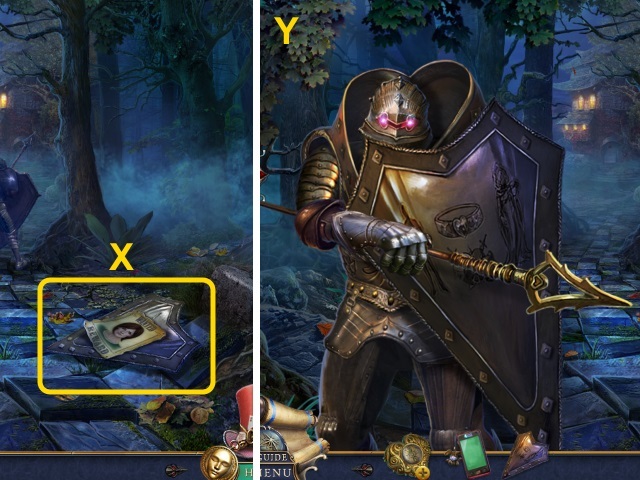 Combine the DIARY and ‘A’ PENDANT (A); read the diary. Take the SILVER KEY (1/2) and note (B). Use the AWL; take the MAGICAL BOTTLE (C). 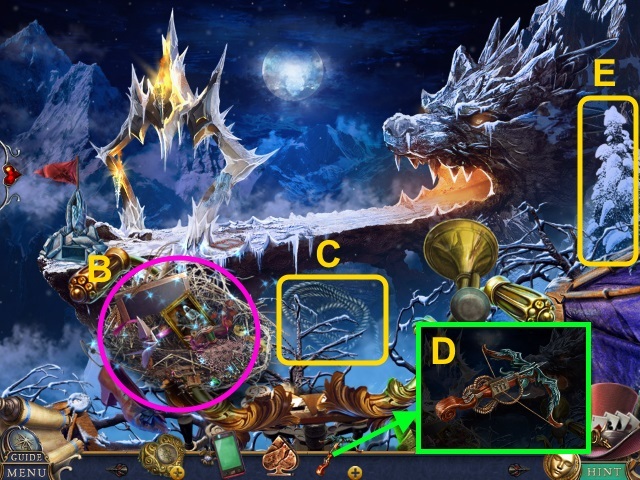 Take the SILVER AND GOLD KEYS (2/2) (D). 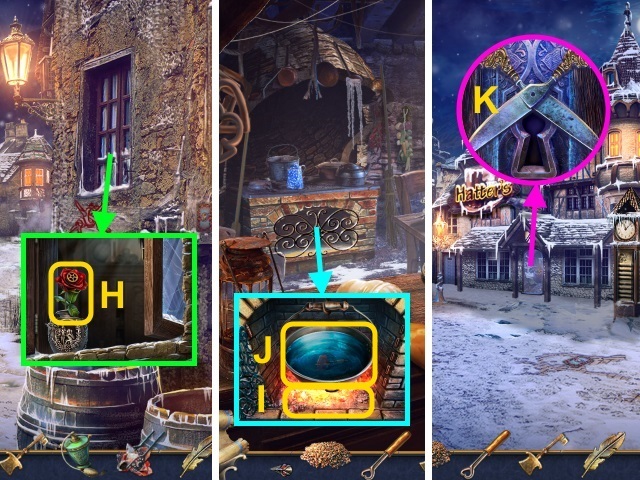 Use the SILVER AND GOLD KEYS (E). 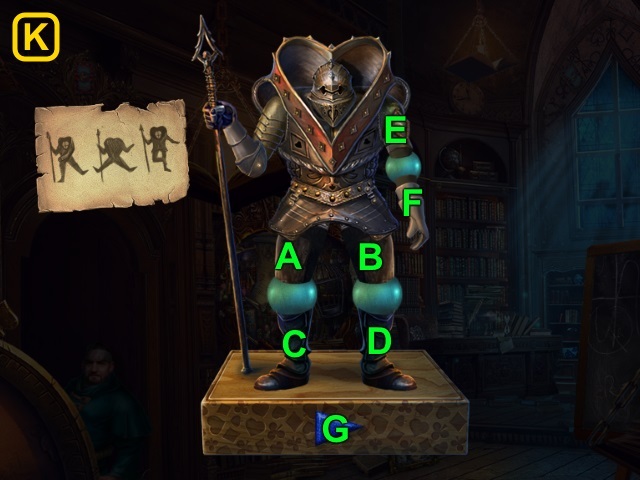 Place the JESTER-HAT FIGURINE (G). 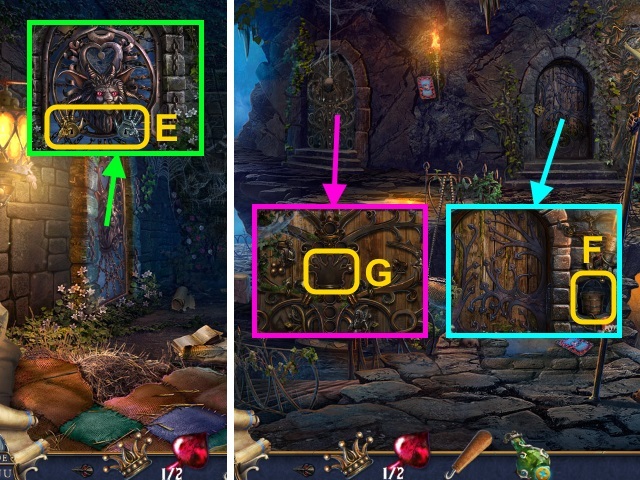 Examine the door (H). 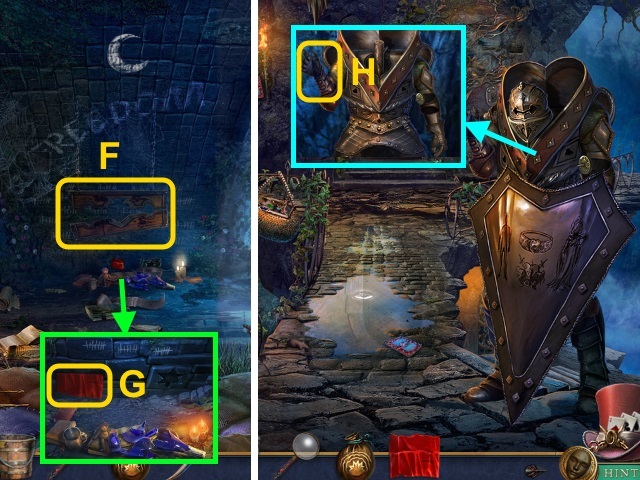 Use the HOOK (I); take the MAGNIFIER and SOLDIER’S HELMET. 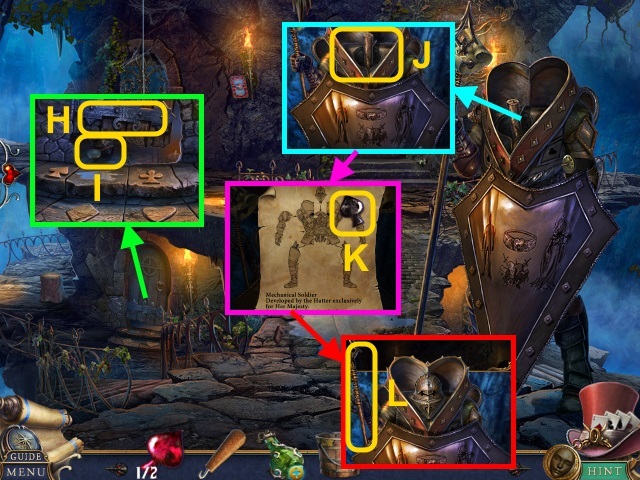 Place the SOLDIER’S HELMET (J). 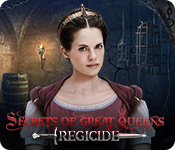 Take the SPADE GEMS (2/2) and note (K). Examine the purse; place the SPADE GEMS (2/2) (M). 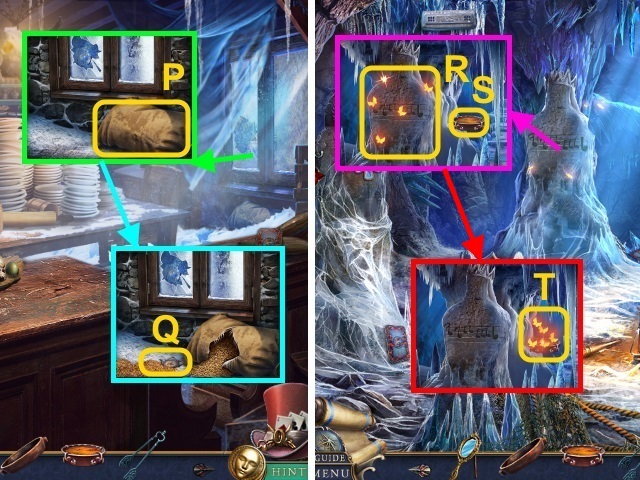 Take the HANGER (N); move the items. Take the CHEWING GUM; read the newspaper (O). Open the wallet; take the ID and FAMILY PHOTO (P). 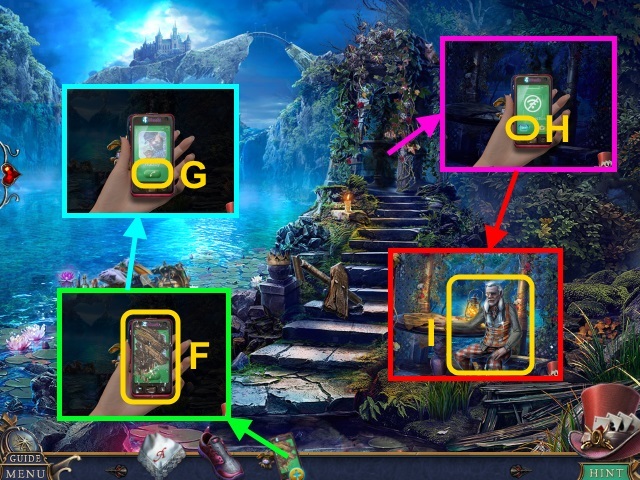 Use the SPEAR and FAMILY PHOTO (Q). 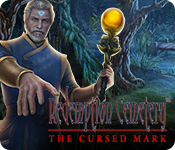 Examine the spear; take the SEAL PIECE (R). 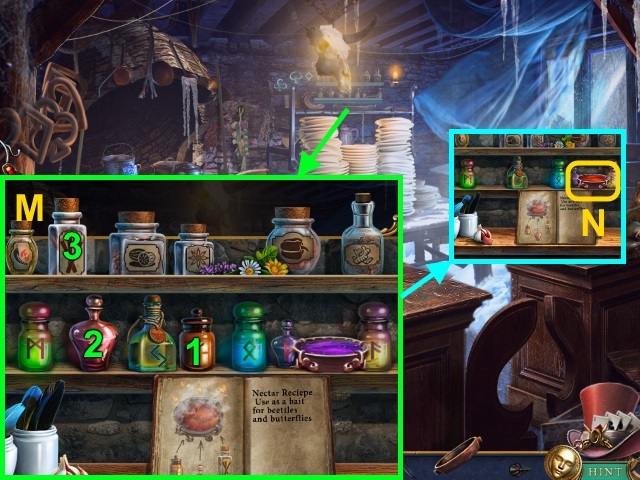 Examine the MAGICAL BOTTLE; place the SEAL PIECE for a mini-game (S). Use the ROPE and HANGER (V). Take the TORN NET (W). Examine the birds; take the BROKEN TOKEN (X). Combine the BROKEN TOKEN and CHEWING GUM (Y); take the TOKEN. 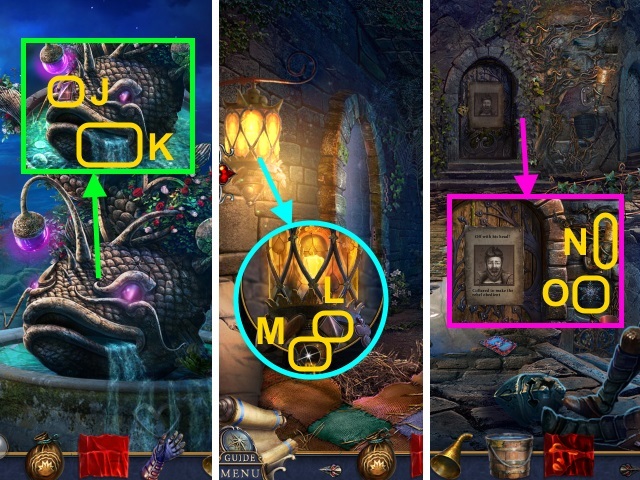 Examine the locket (Z); open it. 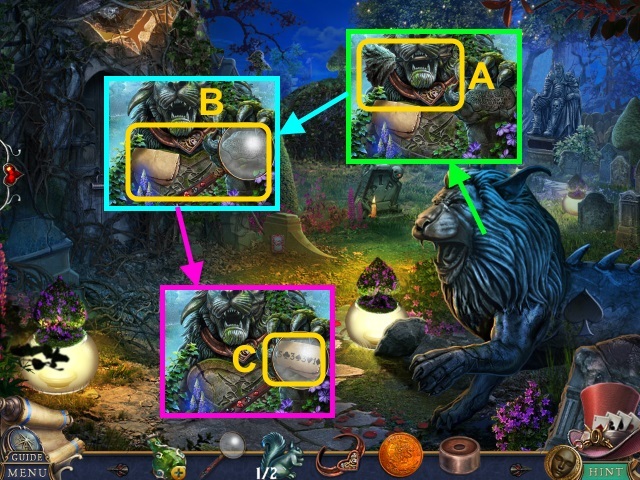 Place the 2 TOKENS; take the FISH LANTERN (C). 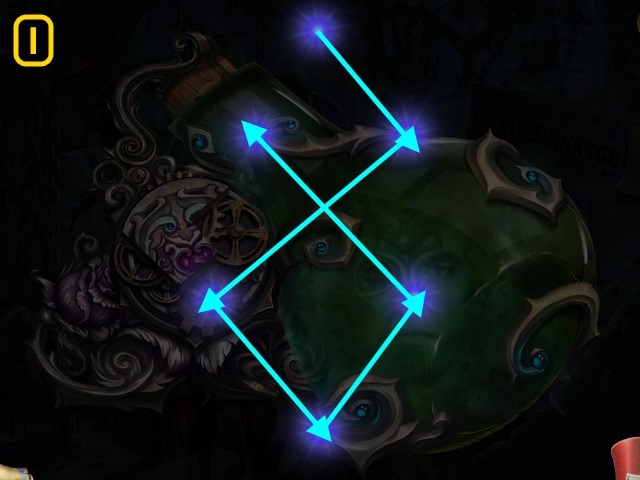 Place the FISH LANTERN (D); take the VEIL (E). Combine the TORN NET and VEIL; take the NET (F). Take the SEAL PIECE (G). 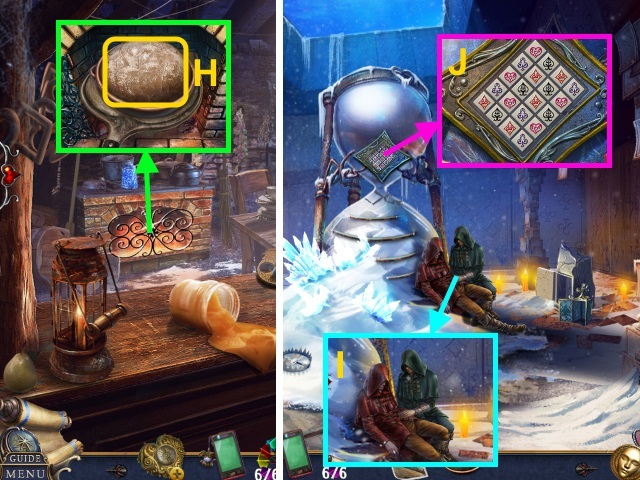 Combine the MAGICAL BOTTLE and SEAL PIECE for a mini-game (H). 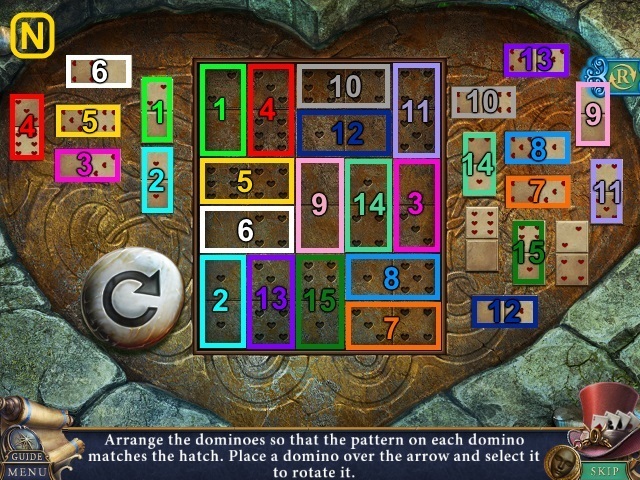 Use the NET for a mini-game (L). Take the BANDERSNATCH WHISTLE (N). 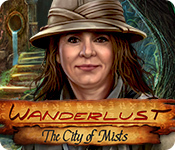 Give the BANDERSNATCH WHISTLE (O). 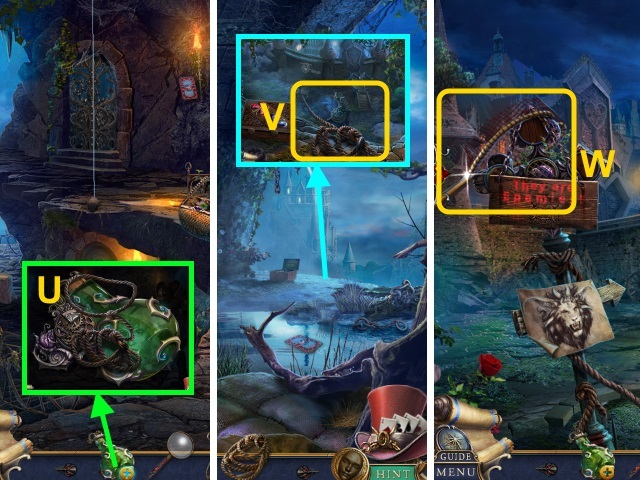 Use the Watch (P); receive the BANDERSNATCH WHISTLE. 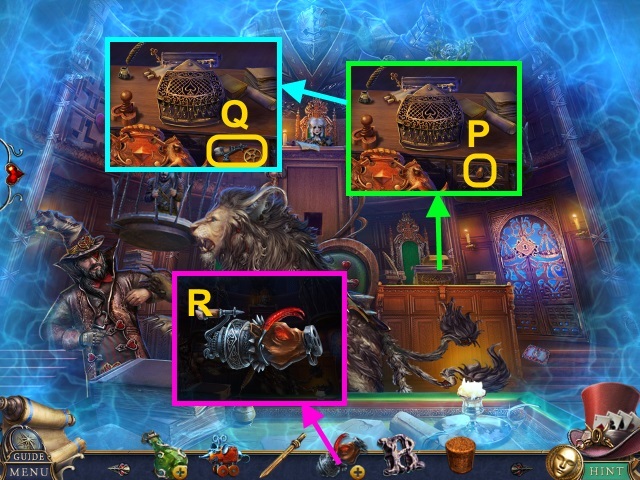 Use the BANDERSNATCH WHISTLE (Q). Use the PHONE; press the button (R). Walk forward, scroll left, then walk left. 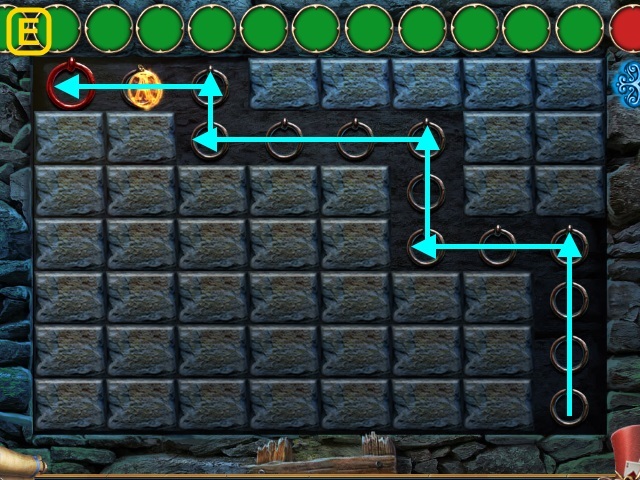 Use the MAZE ROUTE for a mini-game (S). Examine the poster; take the SHIELD (X). 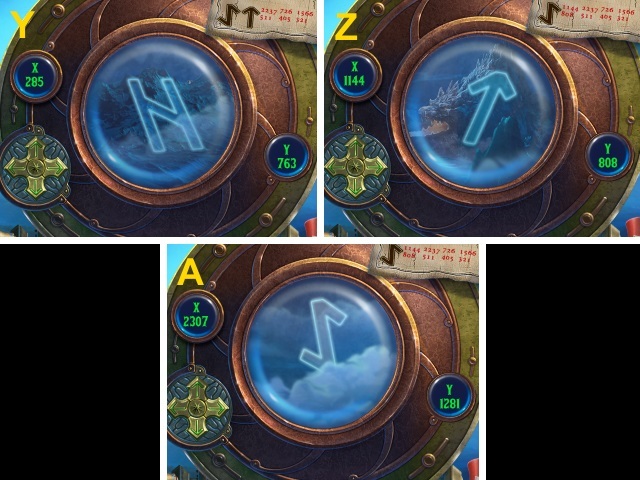 Use the SHIELD for a mini-game (Y). 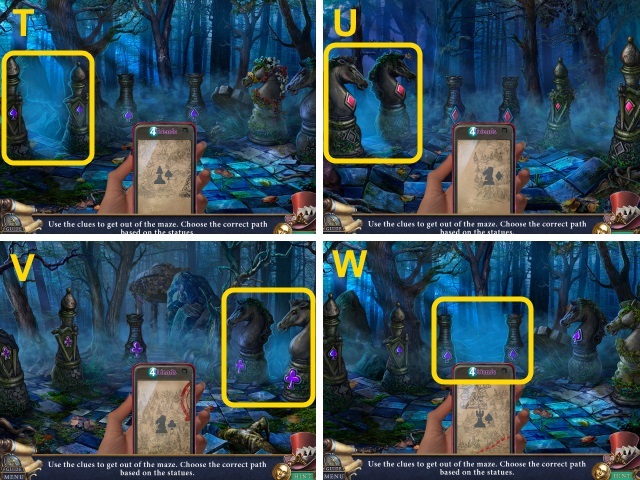 Talk to Chronicle; take the MAP PIECE (L). Take the CROWN and HOUSE KEY (M). Use the HOUSE KEY (N). 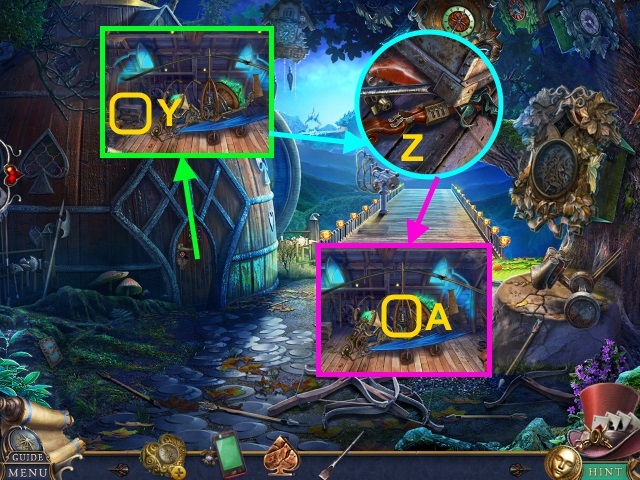 Combine the SEARCHING COMPASS and MAP PIECE for a mini-game (O). Take the PORTRAIT (1/3) (Q). Take the PORTRAIT (2/3) (R). Use the PHONE; press the button (S). Receive the TIME CODE. 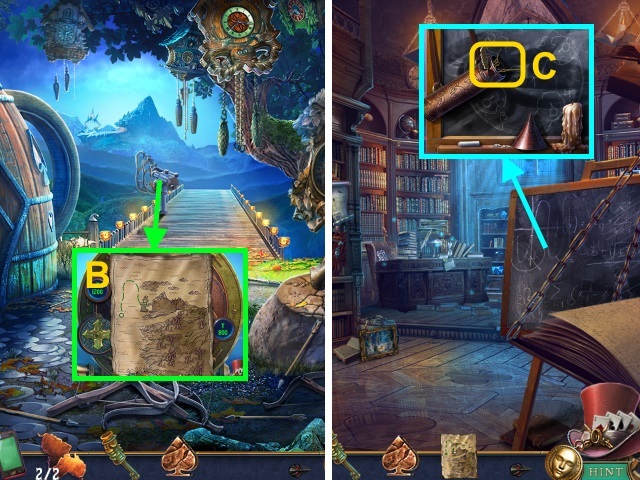 Examine the scroll (T); use the TIME CODE (U). 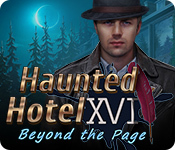 Examine the clock (V). Take the PORTRAIT (3/3) (W). 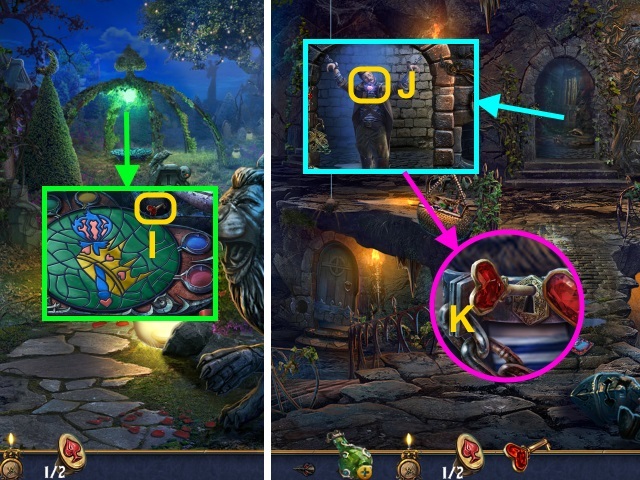 Place the PORTRAITS (3/3) (X). Take the STEERING-WHEEL FIGURINE; examine the map (Y). 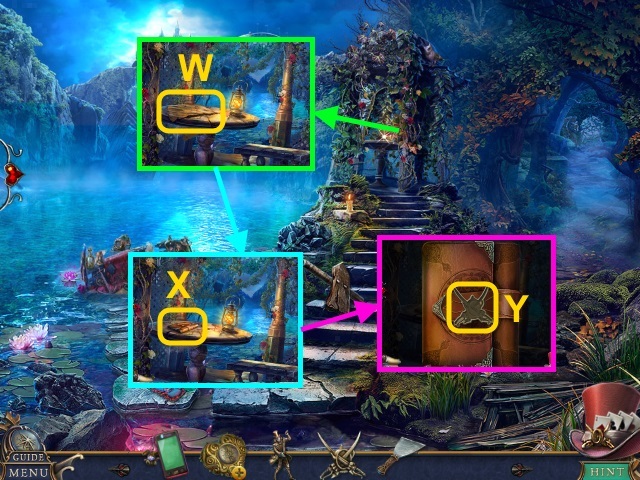 Use the MAP PIECE; examine the map 2x (Z). 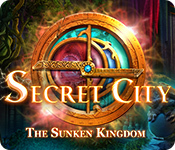 Receive the CASTLE MAP. 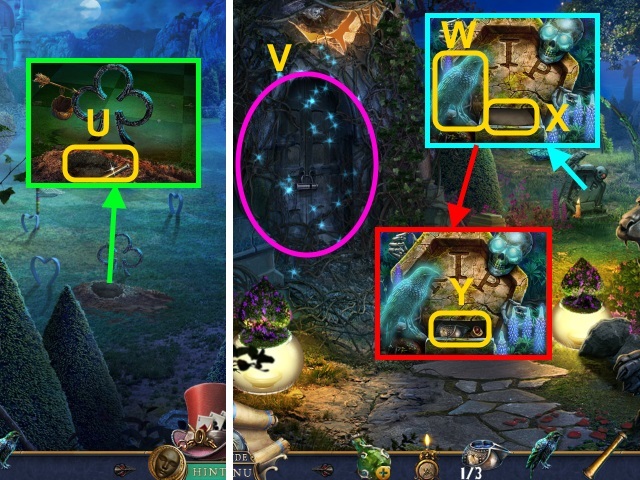 Give the CASTLE MAP; take the SHRINKING POTION (A). Remove the cap; drink the SHRINKING POTION (B). Play the HOP; receive the STRAINER (C). 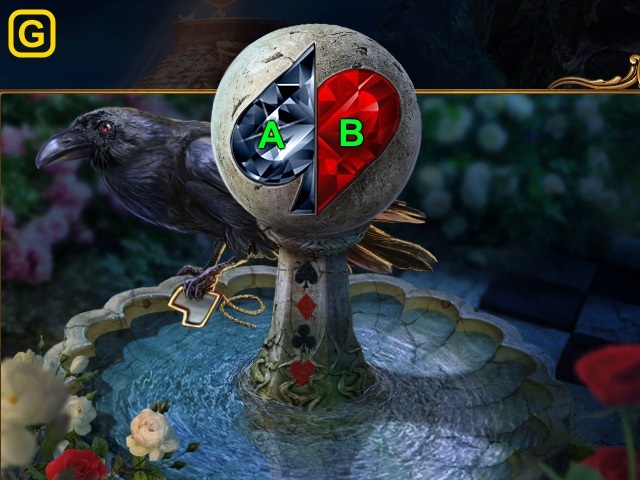 Place the CROWN; take the HEART GEM (E) and BROKEN WHEEL (F). Take the ANCHOR FIGURINE (G). Use the STRAINER; take the SCREWS (H). Place the STEERING WHEEL FIGURINE and ANCHOR FIGURINE (I); take the FLUTE (J). Use the FLUTE; take the COIN (K). Combine the BROKEN WHEEL and SCREWS; use the COIN. Take the WHEEL (L). Place the WHEEL; take the CART (M). Examine the pelican; use the CART (N). Receive the WOUNDED PELICAN. Use the PICKAXE; remove the stones (P). 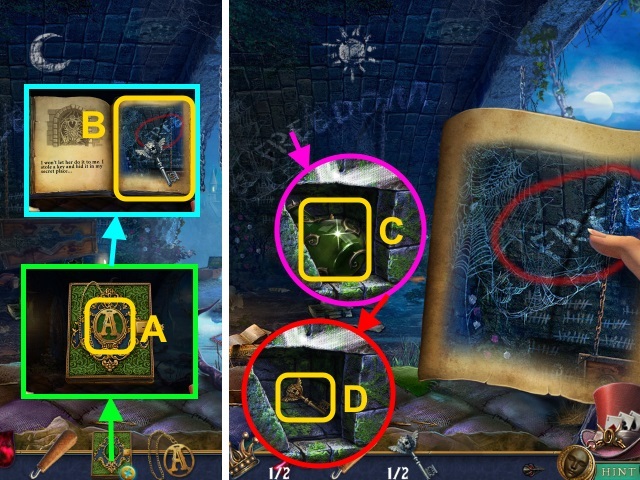 Combine the SEARCHING COMPASS and CHRONICLE’S MEDALLION for a mini-game (R). 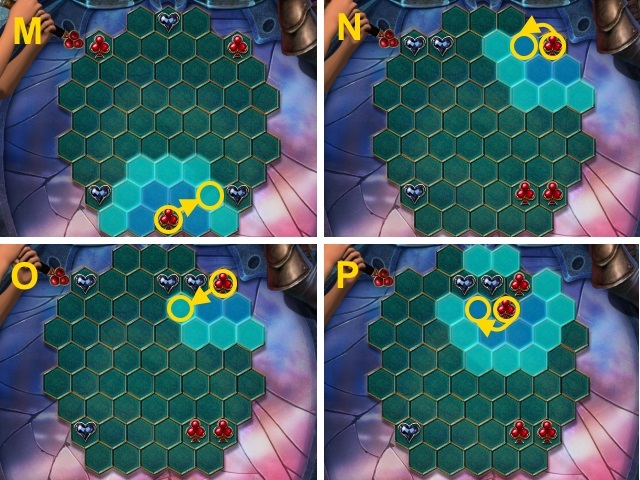 Take the NIPPERS (T); gather the pieces (1-5). 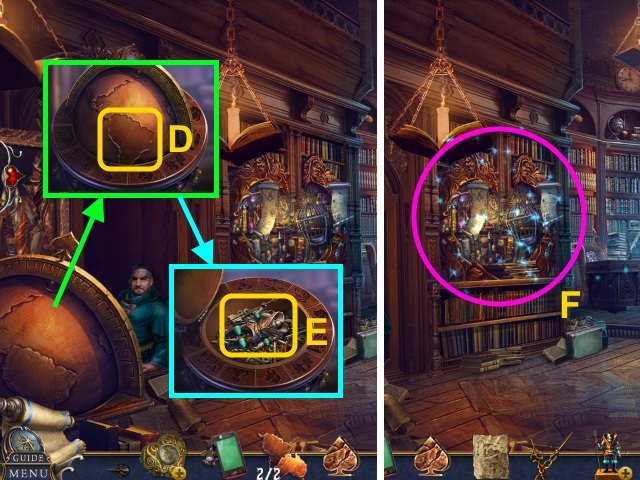 Take the CLOCK-SHAPED KEY (U). Examine the gem; place the HEART GEM (V). Take the BELL TONGUE (W). Use the NIPPERS; take the HOSE (X). Examine the lever (Y); take the DRY SPONGE (Z). 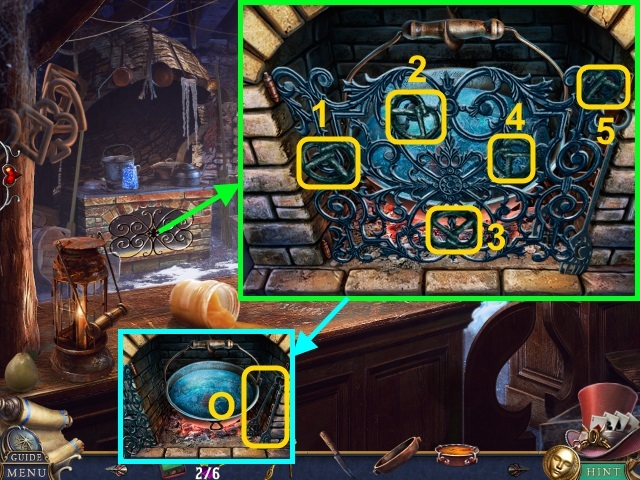 Place the HOSE for a mini-game (A). Take the IMPROVISED LEVER (C). Use the DRY SPONGE (D); receive the WET SPONGE. Place the IMPROVISED LEVER (E); pull it. 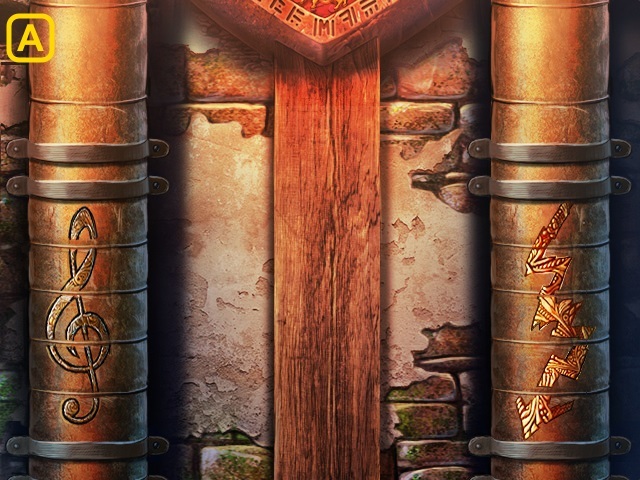 Play the HOP; receive the PROPHECY SCROLL (F). Take the CONTINENT (1/2) (G); use the WET SPONGE. Use the PHONE; press the button (H). Receive the PHOTO OF BELLS. 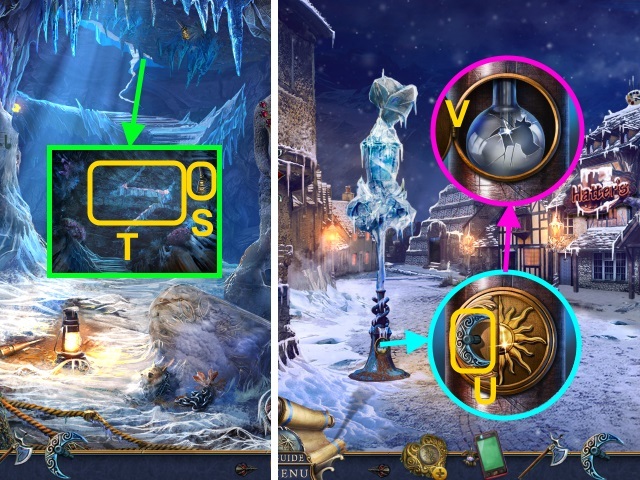 Use the CLOCK-SHAPED KEY (I). Take the DIAMOND LENS (1/2); place the BELL TONGUE (K). 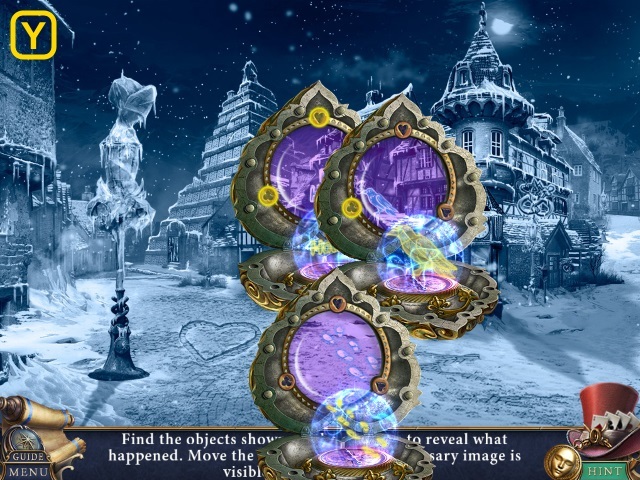 Use the PHOTO OF BELLS for a mini-game. Take the HEALING POTION (M). Examine the WOUNDED PELICAN; remove the arrow (N). Use the BANDAGE and HEALING POTION; apply the potion to the bandage (O). Examine the bandage; take the PELICAN (P). 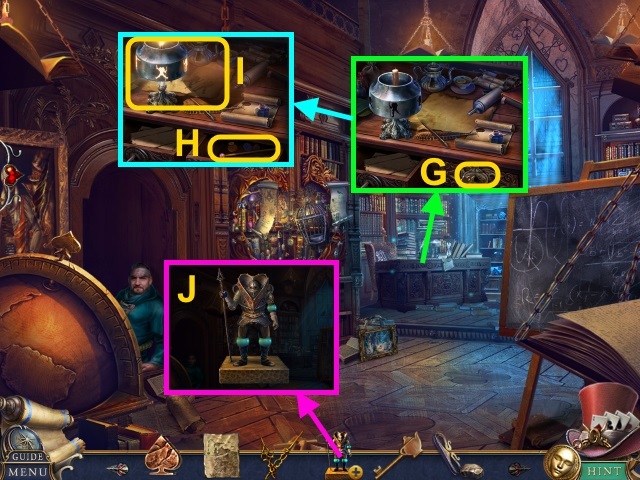 Take the QUILL FIGURINE (R). 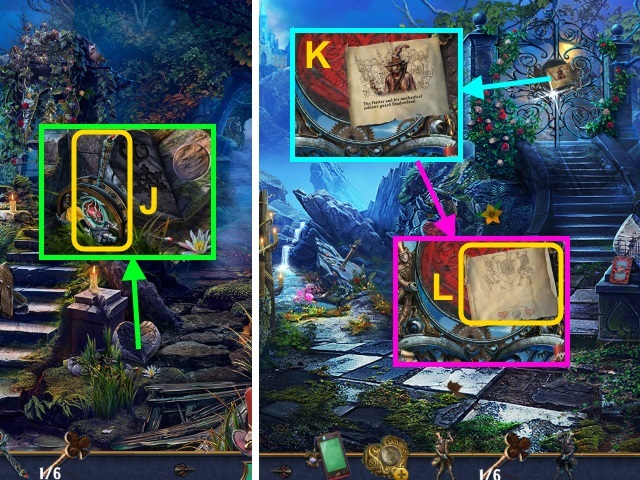 Combine the PROPHECY SCROLL and QUILL FIGURINE (S); read the scroll. Take the CHESS KING (T). Place the CHESS KING (U). Use the PHONE (V); press the button (W). Play the HOP; receive the POWDER (Y). 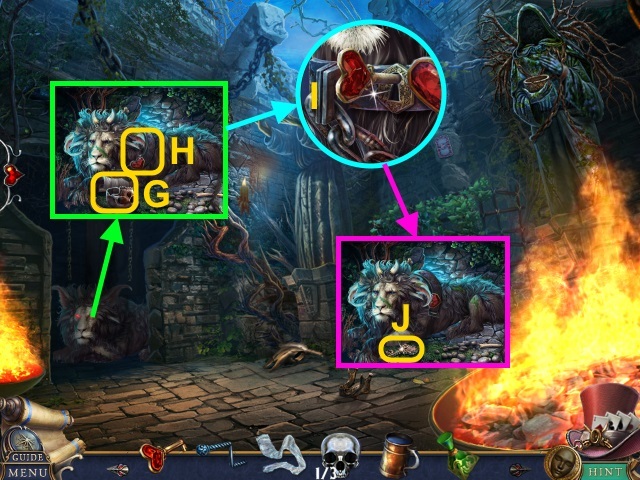 Examine CHESHIRE’S DAGGER 5x (A); receive the SEAL PIECE and DAGGER. 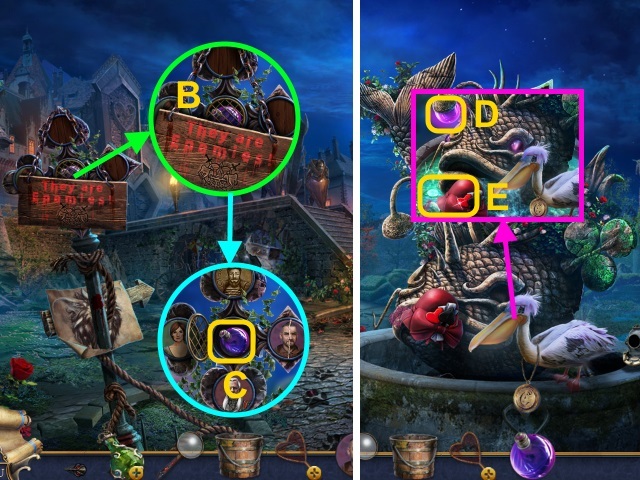 Combine the MAGICAL BOTTLE and SEAL PIECE for a mini-game (B). 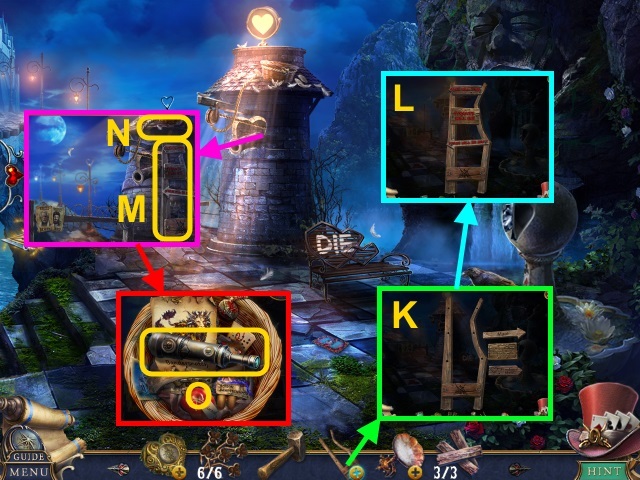 Examine the ladder for a mini-game (D). Use the DAGGER; receive the FABRIC (G). Remove the shield and helmet; take the GAUNTLET (H). Walk down, then right; scroll right. 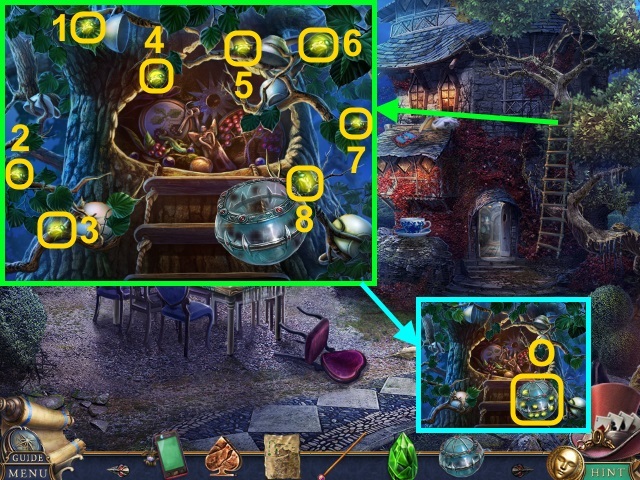 Take the LAMP DECORATION (J). Use the BUCKET (K); receive the WATER. 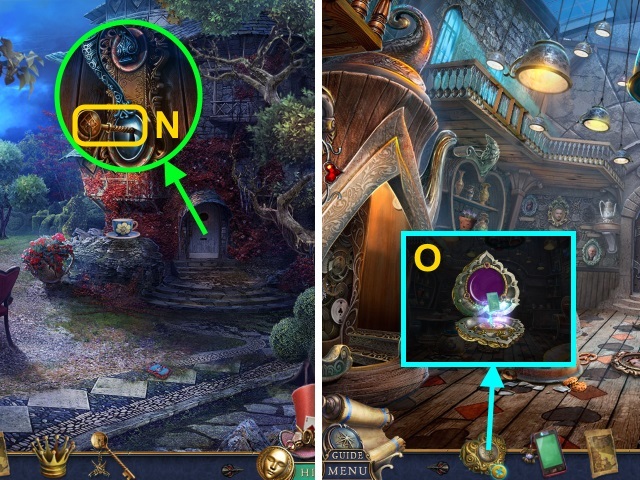 Place the LAMP DECORATION (L). Use the FABRIC (M); receive the OILY FABRIC. Use the OILY FABRIC; examine the torch (N). Take the SNOWFLAKE (O). Play the HOP; receive the WINDING KEY (P). 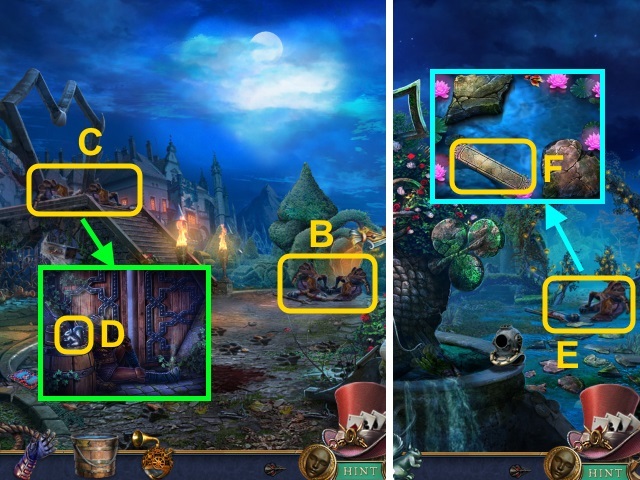 Examine the bird (R); take the STAIRS CODE (S). 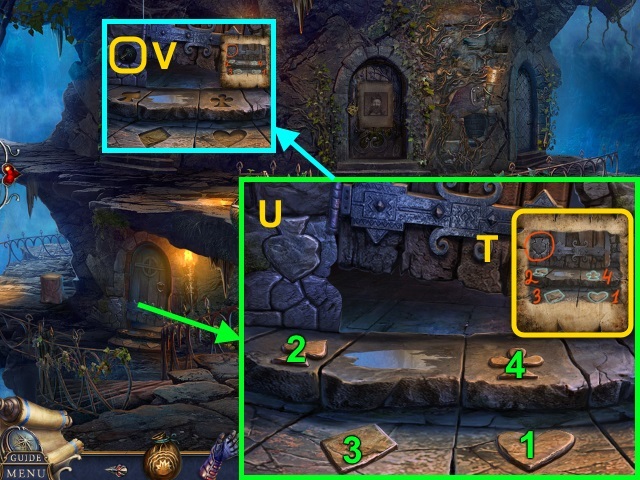 Place the STAIRS CODE for a mini-game (T). Take the SPADE KEY (V). 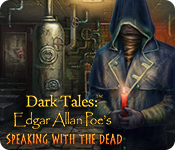 Use the SPADE KEY (W); open the door. Use the WATER (X); take the BROKEN BOMB (Y). 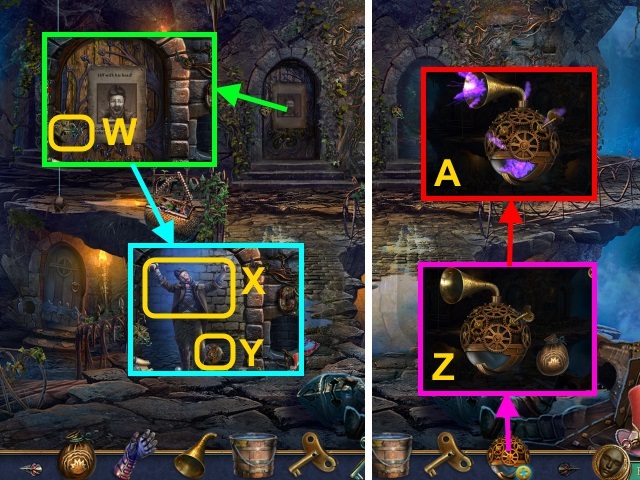 Combine the BROKEN BOMB, POWDER, HORN, and WINDING KEY (Z). Pour the powder; turn the key. Take the ANTI-KNIGHT BOMB (A). Use the ANTI-KNIGHT BOMB 2x (B-C). Take the SQUIRREL STATUETTE (1/2) (D). Use the ANTI-KNIGHT BOMB (E). 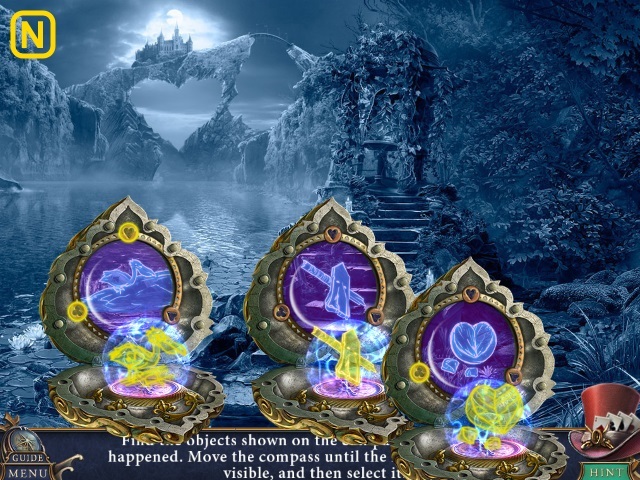 Take the STONE PLATE (F). Take the CROQUET MALLET (1/3) (G). Move the balls; examine the hedgehog (H). Use the GAUNTLET (I); receive the HEDGEHOG. Use the SICKLE 2x; take the JACK (K) and CROQUET MALLETS (2/3) (L). Use the WATER; take the CROQUET MALLETS (3/3) (M). Open the pouch; take the note and TWEEZERS (O). 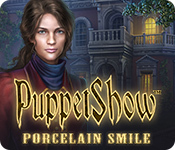 Use the SICKLE; take the STONE COLLAR (P). 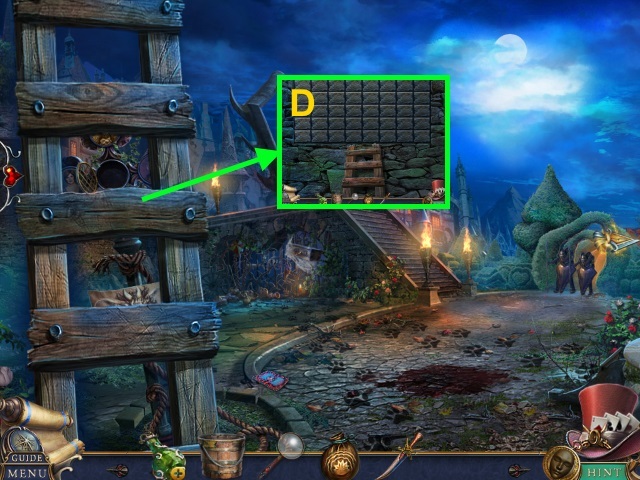 Examine the crate for a mini-game; solution (R). Combine the HEDGEHOG and APPLE. Use the TWEEZERS (T); receive the WIRE. 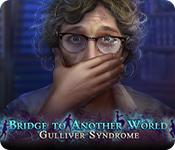 Take the BROKEN BRIDGE (V). 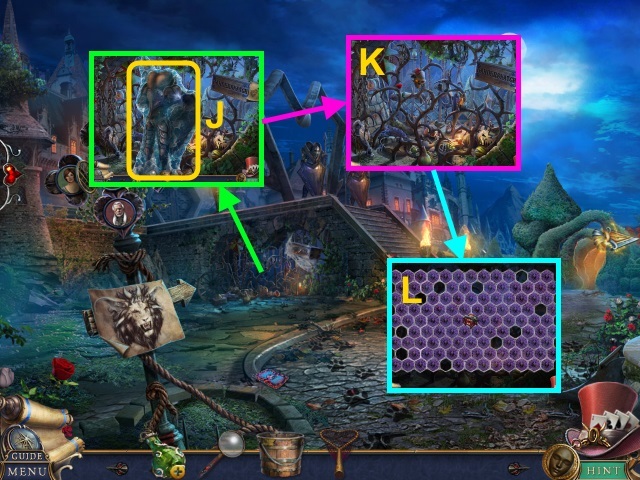 Combine the BROKEN BRIDGE, CROQUET MALLETS (3/3), and WIRE (3/3) (W); take the PORTABLE BRIDGE. Place the PORTABLE BRIDGE (X). 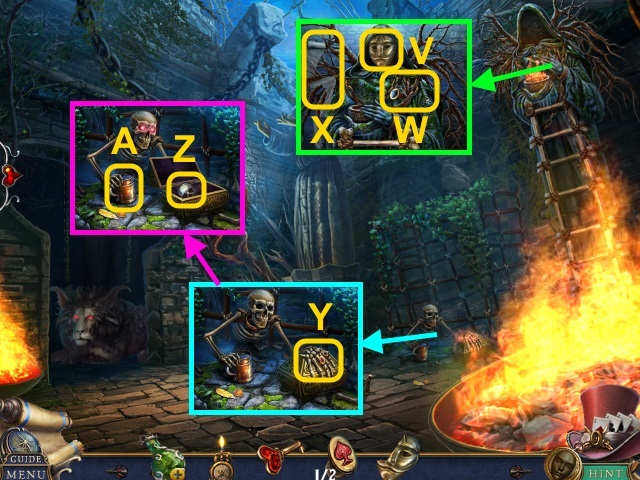 Place the STONE PLATE (Y); take the CODE LOCK BUTTON (Z). Place the STONE COLLAR; take the DUST BROOM (A). Use the MAGNIFIER; examine the paper (B). 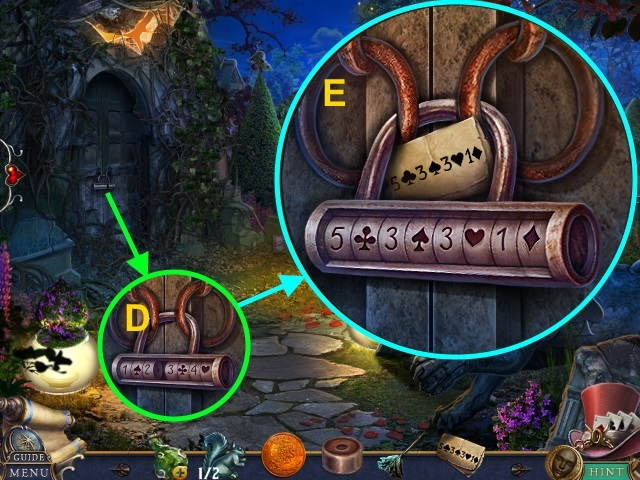 Place the LOCK CODE and CODE LOCK BUTTON for a mini-game (D). 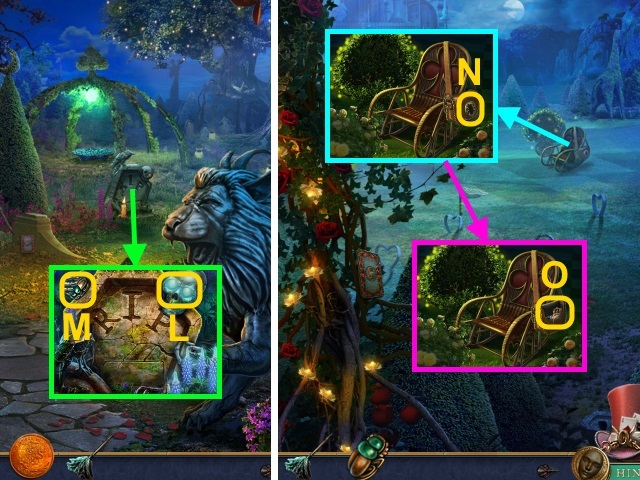 Play the HOP; receive the SEAL PIECE (F). 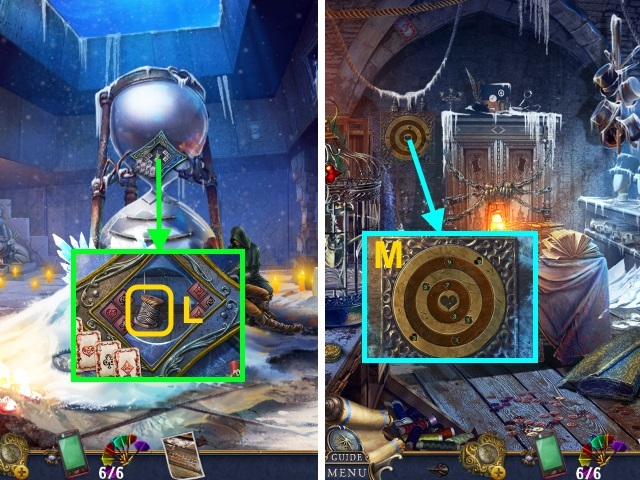 Combine the MAGICAL BOTTLE and SEAL PIECE for a mini-game (G). Take the MONOCLE OF REVEALING (I). Use the MONOCLE OF REVEALING (J). Examine the glass; take the SQUIRREL STATUETTES (2/2) (K). 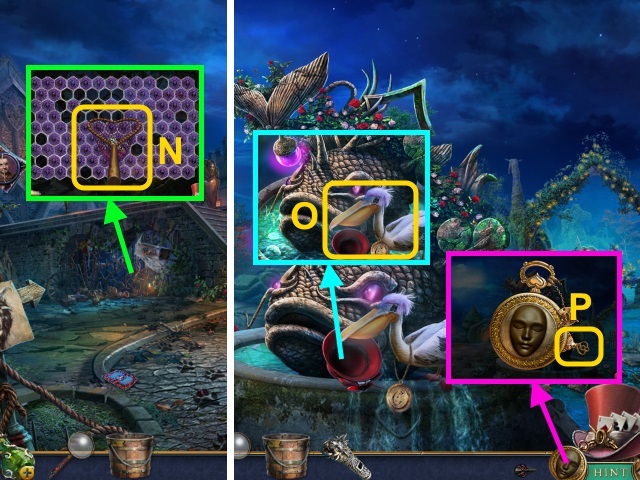 Place the COIN (L); take the BEETLE (M). Take the LIGHTER and BLUE PAINT (1/3) (O). Place the SQUIRREL STATUETTES (2/2) (P). Use the DUST BROOM; take the SHOVEL (Q). 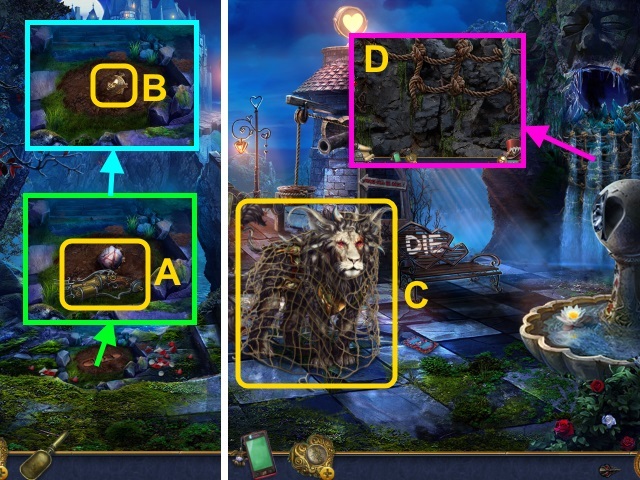 Stack the boxes (R); examine the cage (S). Take the STONE CROW (T). Use the SHOVEL; take the PESTLE (U). Play the HOP; receive the PAINTS (2/3) (V). Move the stone; place the STONE CROW (W). Read the paper (X). Take the JAR and SPADES RING (1/2) (Y). Use the JAR (Z); collect the berries (A). Take the JAR WITH BERRIES (B). Combine the JAR WITH BERRIES and PESTLE (C); take the PAINTS (3/3). 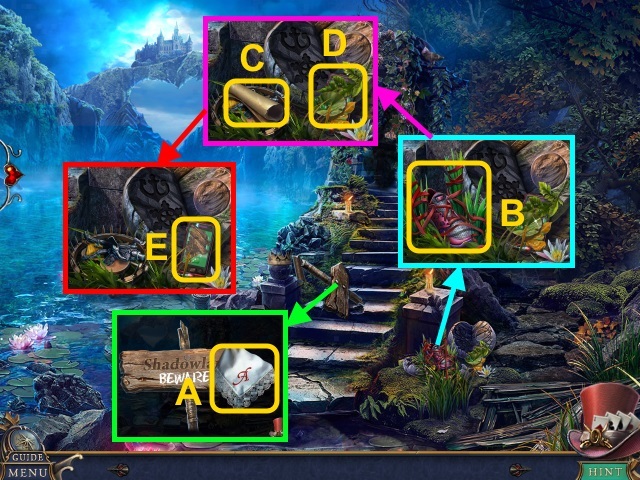 Place the PAINTS (3/3) for a mini-game (D). Read the note; take the COLLAR KEY (I). Walk down. Scroll left; go left twice. Move the gem; use the COLLAR KEY (K). 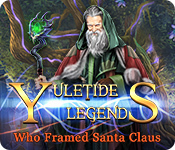 Talk to Chronicle; take the ANTLER (L). Take the ANVIL HANDLE (N). Take the FIREWORKS KEY (O). Examine the handle; place the ANVIL HANDLE (P). Examine the anvil (Q). Take the SPADE SYMBOL (R). 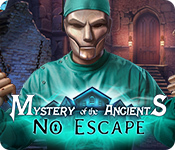 Examine the door; take the CONTINENTS (2/2) (S). Scroll down; open the book. Take the TELESCOPE LENSES (2/2) (T); close the book. 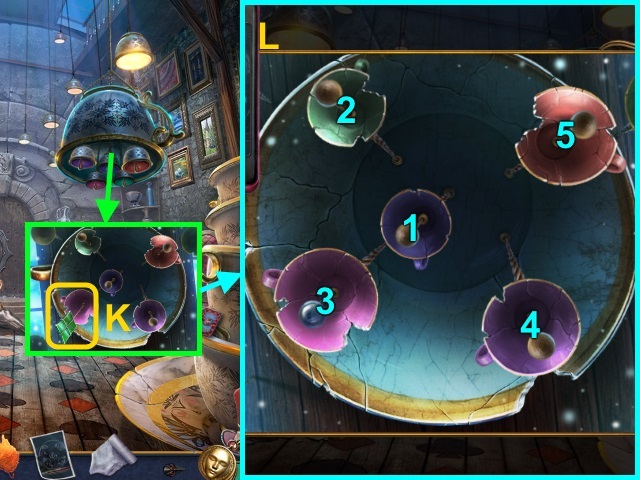 Examine the lenses (U); place the TELESCOPE LENSES (2/2) for a mini-game. Take the MAP WITH COORDINATES (B). 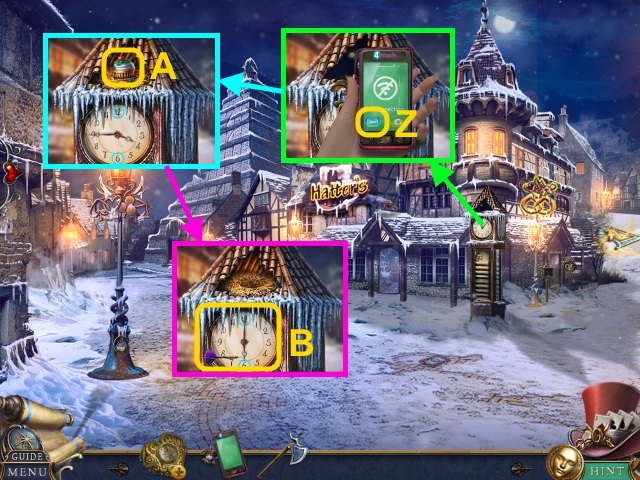 Use the FIREWORKS KEY; take the CLOCK HANDS (C). Place the CONTINENTS (2/2) (D). 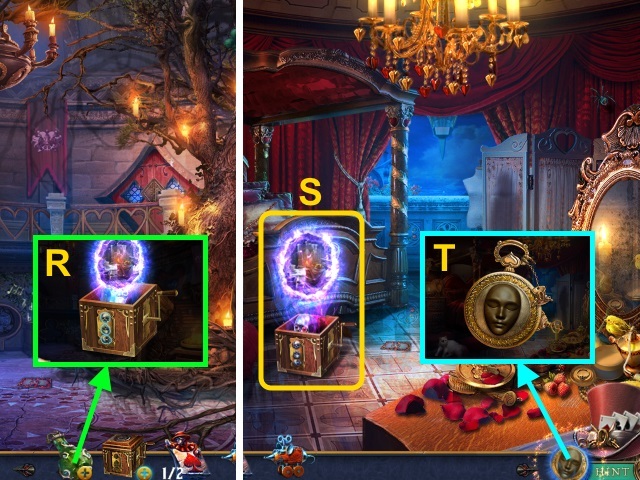 Take the KNIGHT BOX and POT-SHAPED KEY (E). 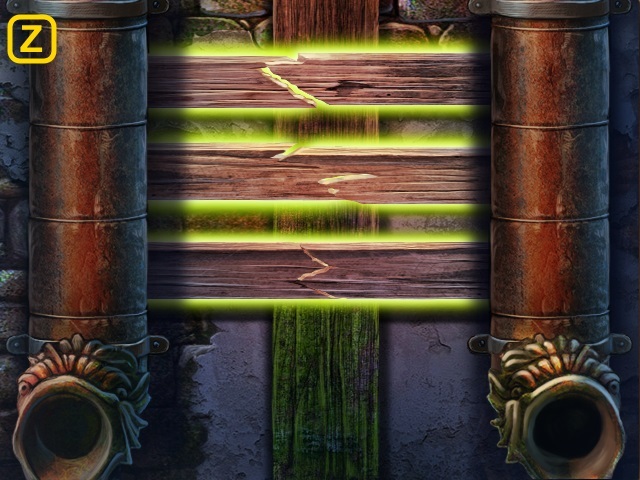 Play the HOP; receive the FLINT (F). Use the POT-SHAPED KEY (G). Take the KNITTING NEEDLE (H). 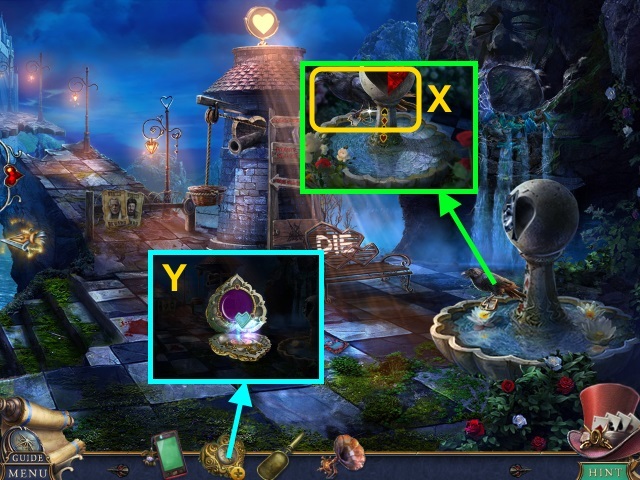 Use the FLINT; examine the lamp 2x (I). Take the KNIGHT SOLUTION. 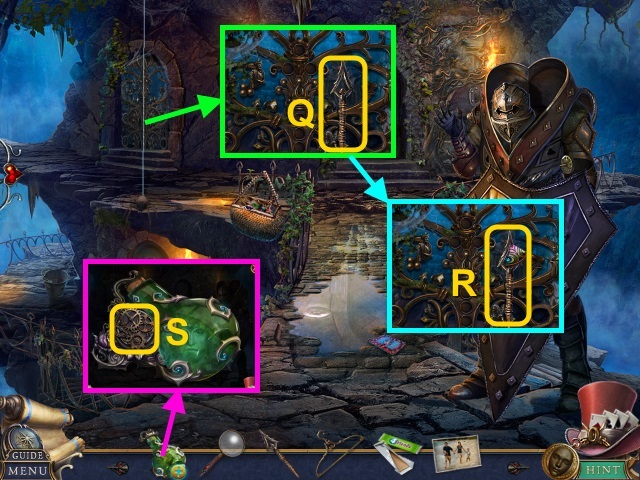 Combine the KNIGHT BOX and KNIGHT SOLUTION for a mini-game (J). Take the ENERGY CRYSTAL (L). 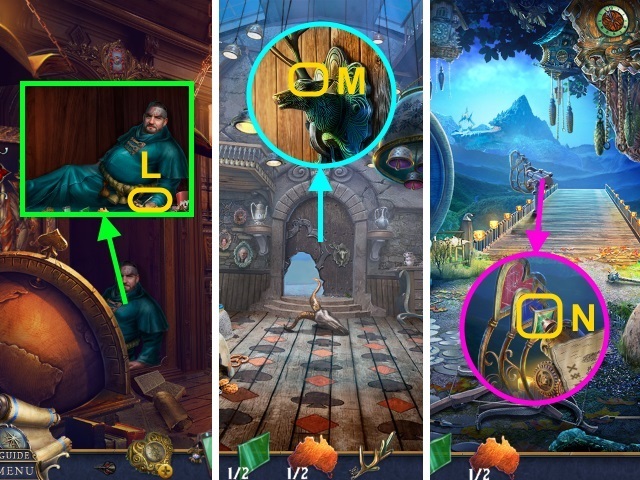 Place the CLOCK HANDS (M). Place the JAR; gather the fireflies (1-8). Scroll up. Use the KNITTING NEEDLE (P); scroll down. 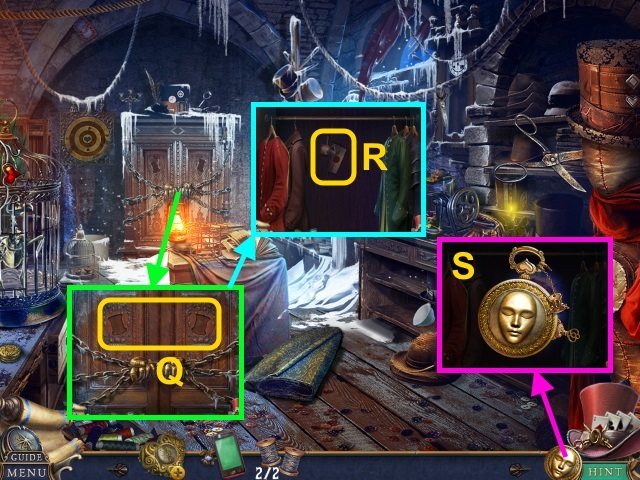 Examine the book; take the SHED KEY (Q). Scroll up; use the SHED KEY (R). 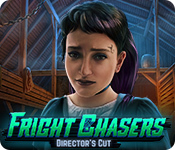 Use the FIREFLIES; take the BENT CROWBAR (S). Place the handlebars (T) on the machine (U). Place the ENERGY CRYSTAL and MAP WITH COORDINATES (W). Place the BENT CROWBAR; use the anvil. Take the CROWBAR (X). 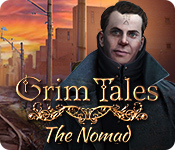 Use the CROWBAR; take the UNLOADED CROSSBOW and SADDLE (Z). 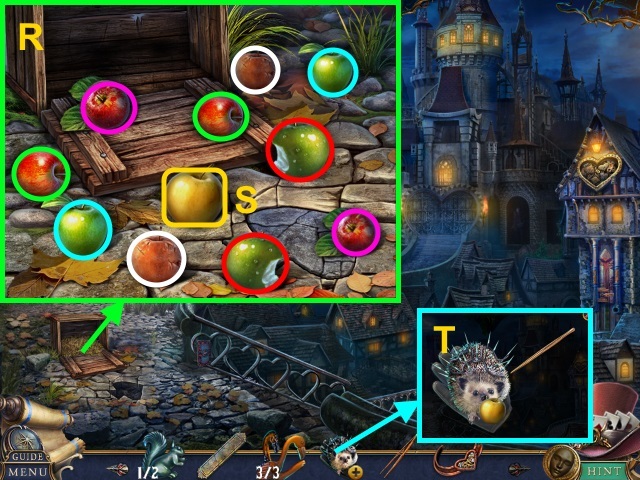 Play the HOP; receive the CROSSBOW BOLT (B). 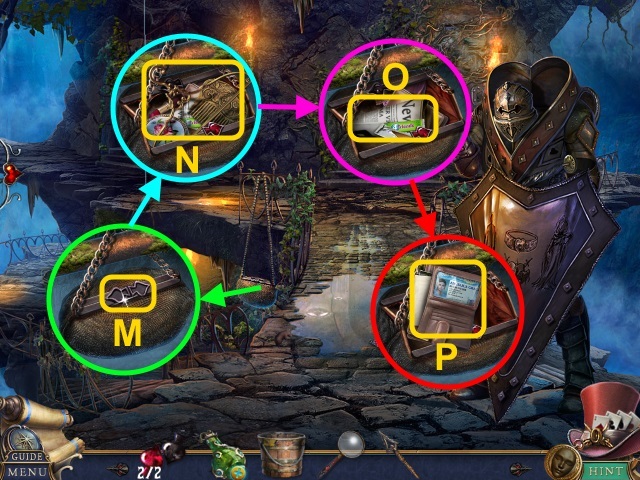 Combine the UNLOADED CROSSBOW, CROSSBOW BOLT, and ROPE (D); examine the crossbow 3x. Receive the LOADED CROSSBOW. Use the LOADED CROSSBOW (E). 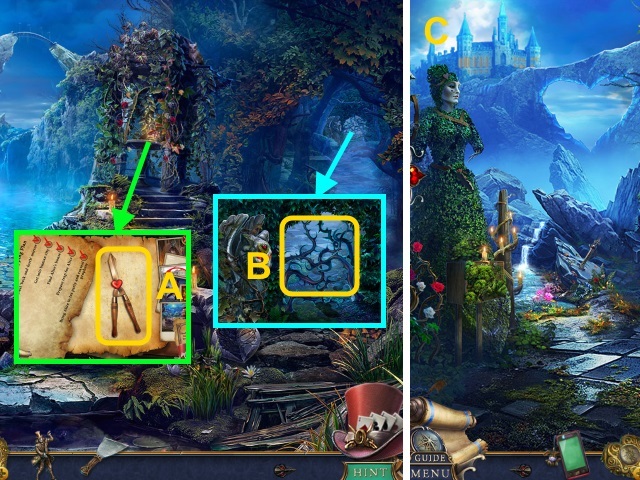 Examine the tree; take the PICKAXE (F). Use the PICKAXE; examine the ice (G). Take the CRESCENT HANDLE (H). 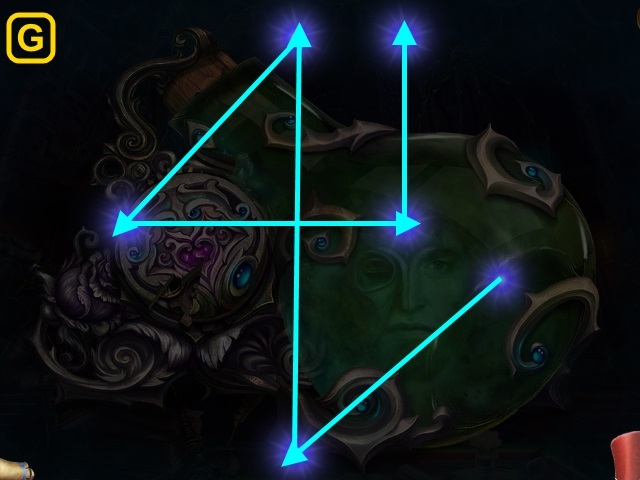 Use the PICKAXE (I); receive the DIAMOND SYMBOL. Place the DIAMOND SYMBOL (J). Use the PHONE; press the button (K). 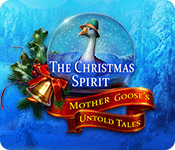 Receive the MUSICAL-NOTES PHOTO. 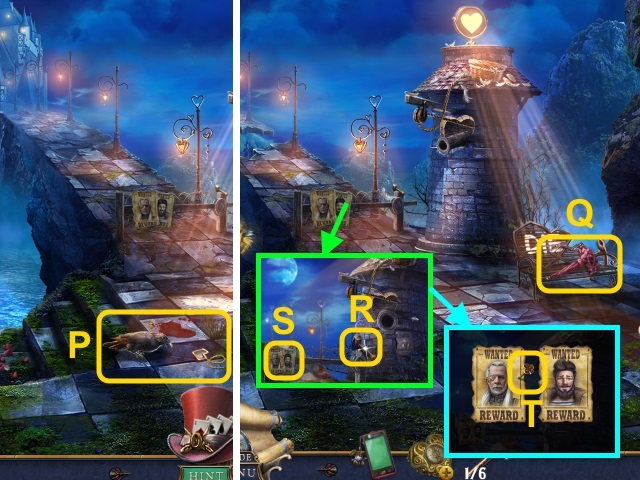 Place the MUSICAL-NOTES PHOTO for a mini-game (L). Take the CLUB MOLD (N). Place the SPADE SYMBOL (O). Move the roots; place the CLUB MOLD (P). Use the PICKAXE; take the CLUB SYMBOL (Q). Place the CLUB SYMBOL (R). Take the OIL (S); use the PICKAXE 3x (T). Place the CRESCENT HANDLE (U); turn it. Take the TOP HAT (W). 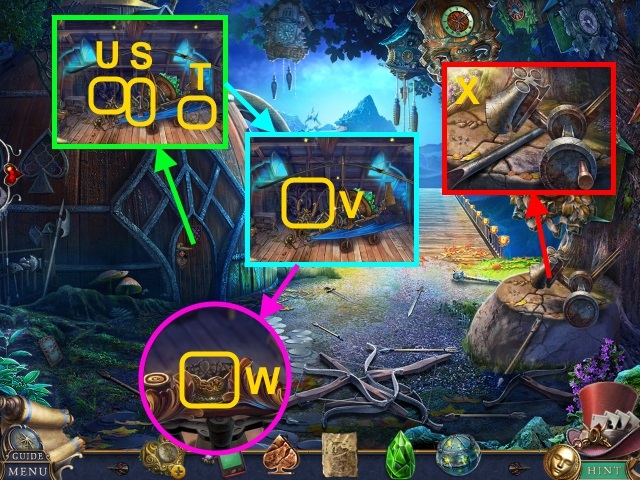 Combine the SEARCHING COMPASS and TOP HAT for a mini-game (X). Use the PHONE; press the button (Z). Take the CUPCAKE FIGURINE (A). Turn the clock hands; take the DART (1/6) (B). Use the PICKAXE; turn the handle (C). 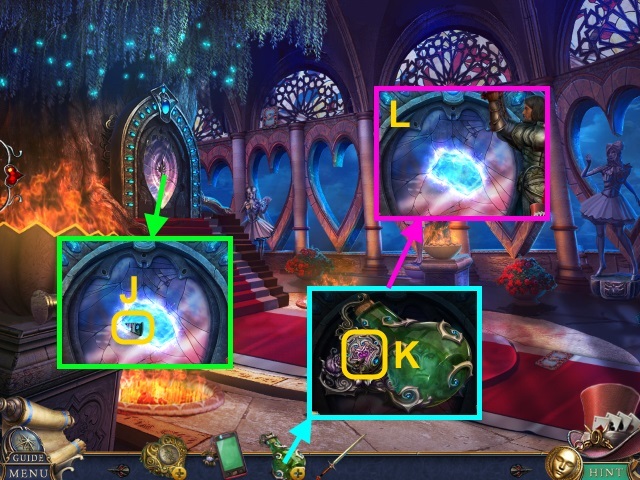 Take the HAND MIRROR (D). Place the CUPCAKE FIGURINE; take the BELLOWS (E). 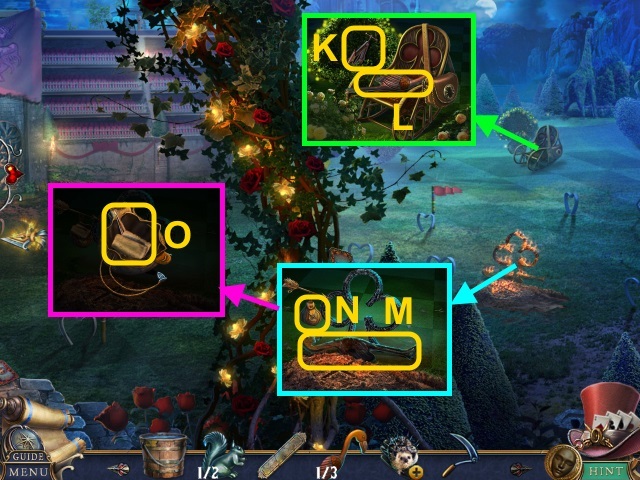 Move the items; use the keys (G). 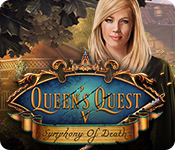 Open the chest; take the scroll, GUN, and DARTS (2/6) (H). Use the GUN; open the door (I). 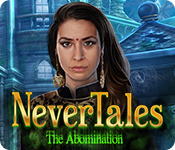 Take the NECTAR RECIPE (K). 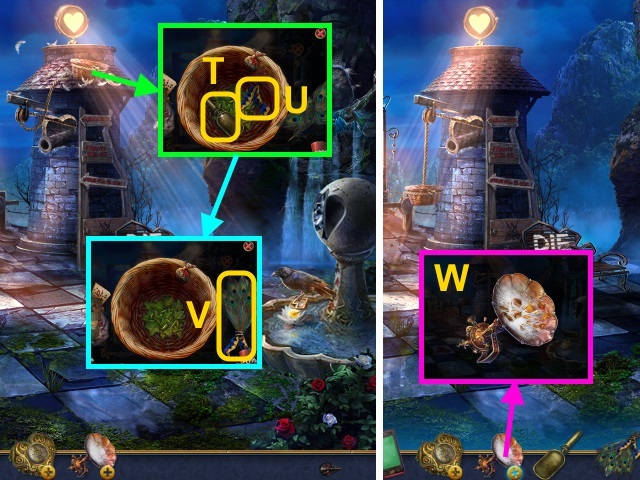 Take the BOWL (L); use the NECTAR RECIPE for a mini-game. Move the sacks; use the KNIFE (P). 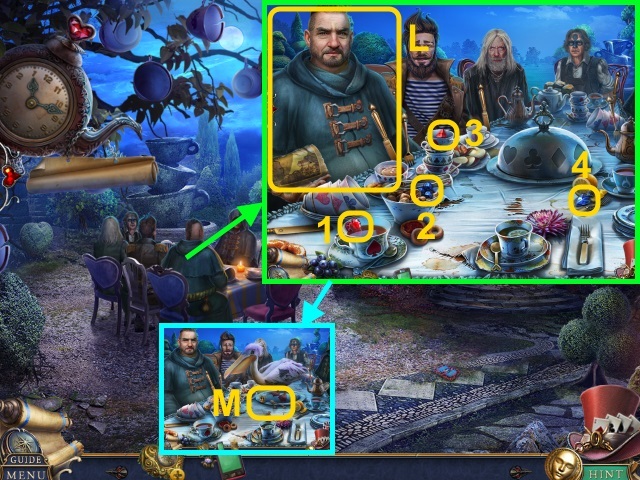 Take the TEAPOT FIGURINE and GRAIN (Q). Use the NECTAR (R); collect the butterflies (S). Take the FIRE BUTTERFLIES (T). 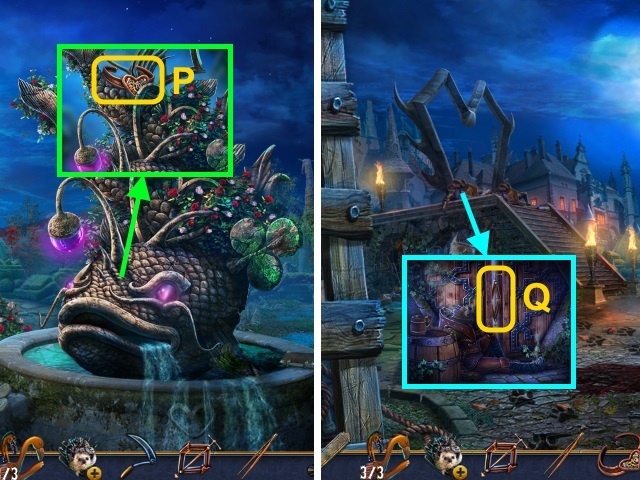 Play the HOP; receive the METAL FIGURINE (U). Place the TEAPOT FIGURINE; take the SCREWDRIVER (V). Walk right, then forward; scroll left. 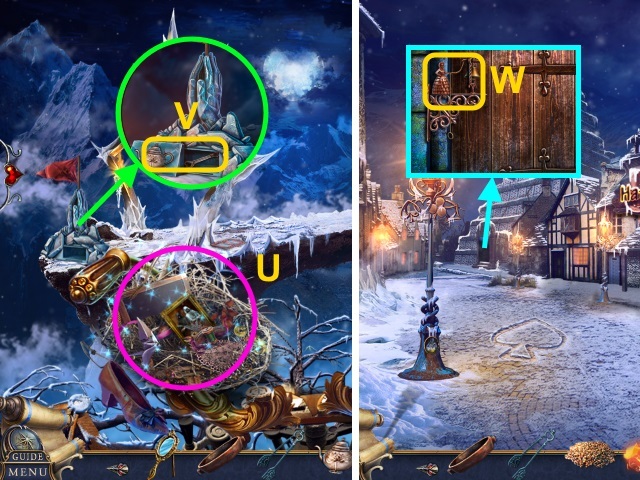 Place the METAL FIGURINE (W); open the door. 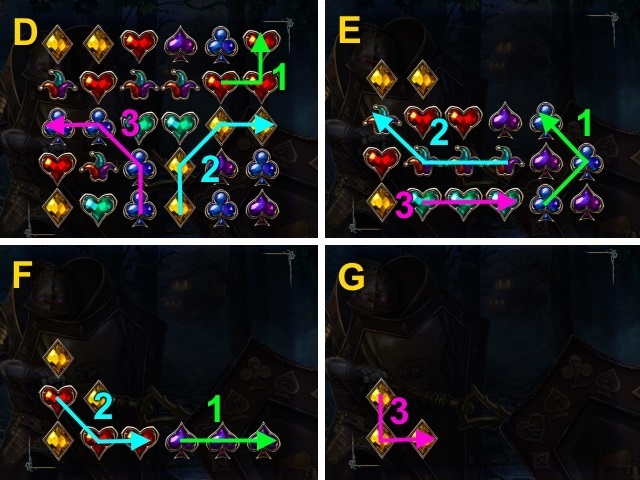 Use the FIRE BUTTERFLIES (X). Talk to the men (Y); receive the HATTER’S KEY. Use the TONGS; receive the HOT COALS (A). 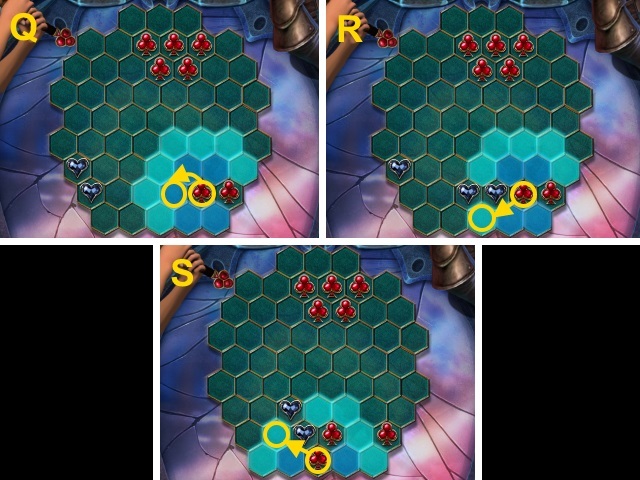 Place the pieces (B); take the DARTS (3/6) (C). 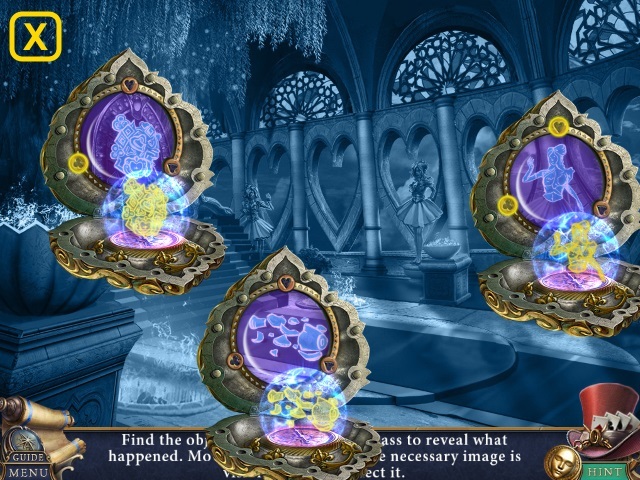 Use the HAND MIRROR; take the MESSENGER CLASP (D). 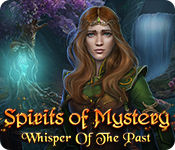 Place the MESSENGER’S CLASP (E). Open the case; read the newspaper (F). Take the METAL FEATHER (G). Use the FERTILIZER; take the GEAR (H). Use the HOT COALS (I); take the DARTS (4/6) and WATER (J). Use the SCREWDRIVER; move the scissors (K). Use the HATTER’S KEY. Remove the gear; place the GEAR (L). 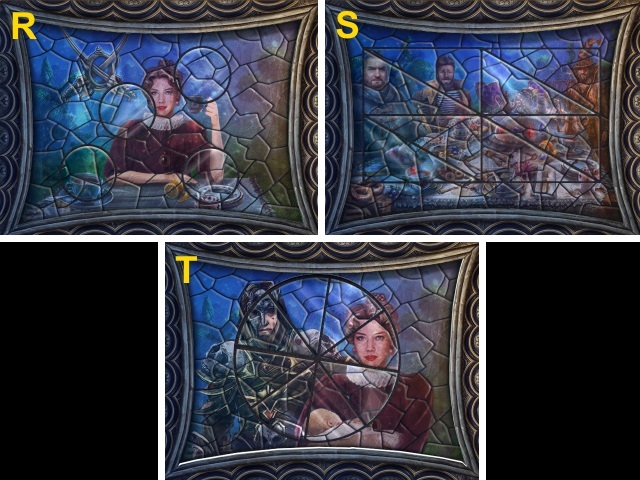 Take the STAINED-GLASS PIECE (M). 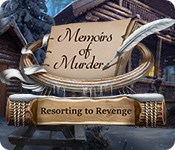 Place the METAL FEATHER; examine the skeleton. Take the SEWING MACHINE FIGURINE (N). Place the SEWING MACHINE FIGURINE (O). 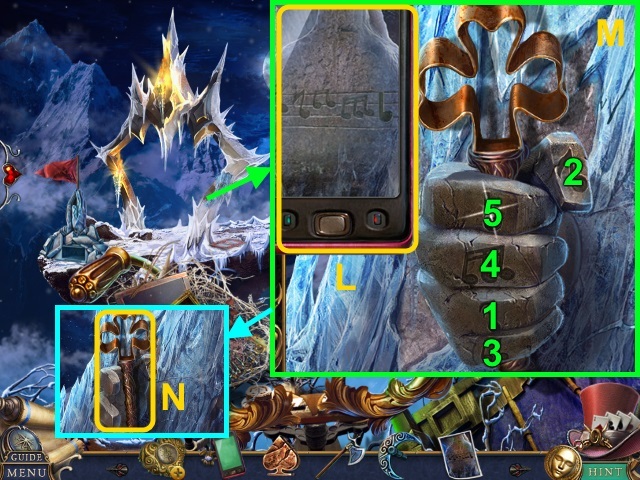 Play the HOP; receive the SPADE FIGURINE (P). 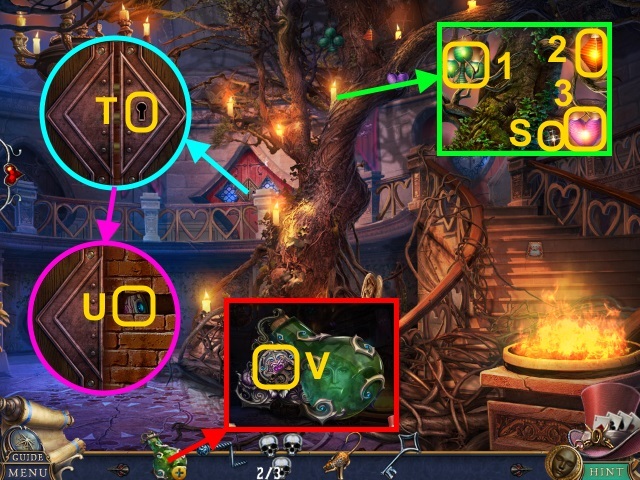 HOP mini-game solution (@): (A-B)-(C-D)-(E-F). 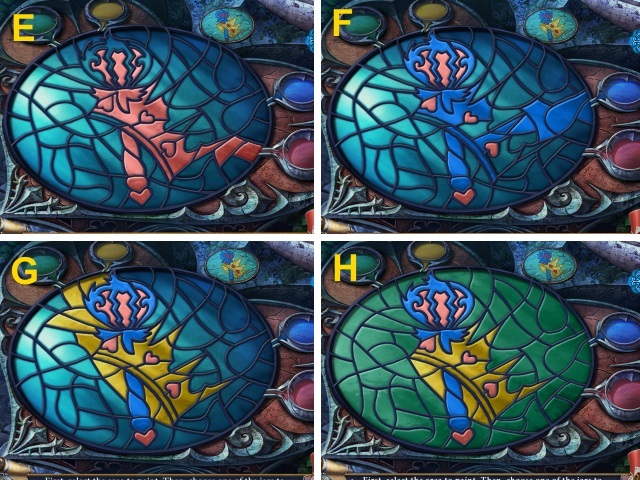 Place the STAINED GLASS PIECE for a mini-game (Q). Take the DRAWER HANDLE (U). 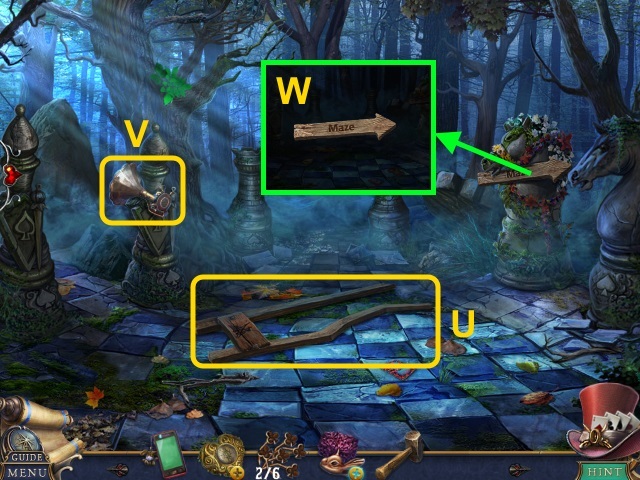 Place the SPADE FIGURINE (V). Take the DARTS (5/6) (W). Play the HOP; receive the DART (6/6) (X). Place the DRAWER HANDLE (Y); open the drawer. Take the PELICAN FIGURINE (Z). 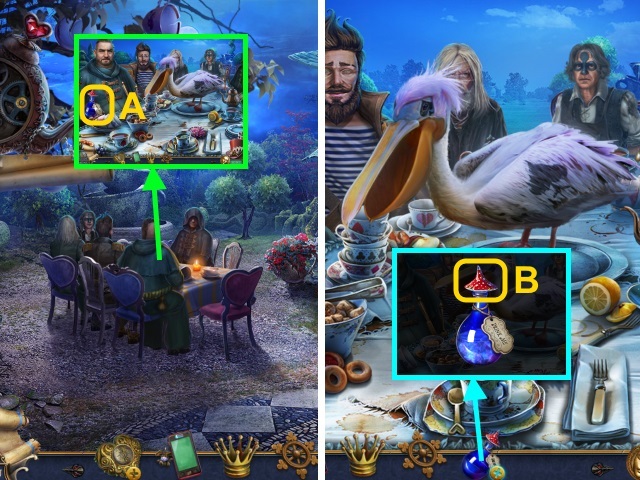 HOP mini-game solution (@): B-C-Bx2-C-Bx2-C-B-C.
Place the PELICAN FIGURINE (A). Take the COFFEE GRINDER (B). Combine the COFFEE GRINDER and GRAIN; take the FLOUR (C). Walk down; scroll right. Walk left. 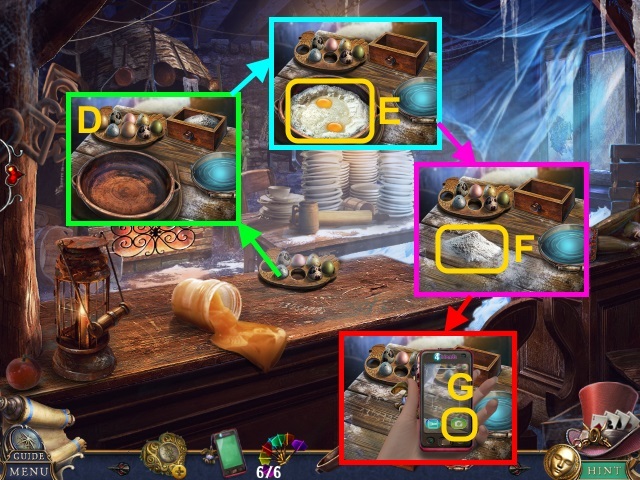 Place the BOWL, WATER and FLOUR (D). Use the flour, eggs, and water; examine the mixture 2x (E). Receive the WARM DOUGH. Move the flour (F); use the PHONE. Press the button (G); receive the DART CODE. Use the WARM DOUGH; take the BREAD (H). Walk down; scroll left. Walk left. Give the BREAD (I); receive the PLAYING CARDS. 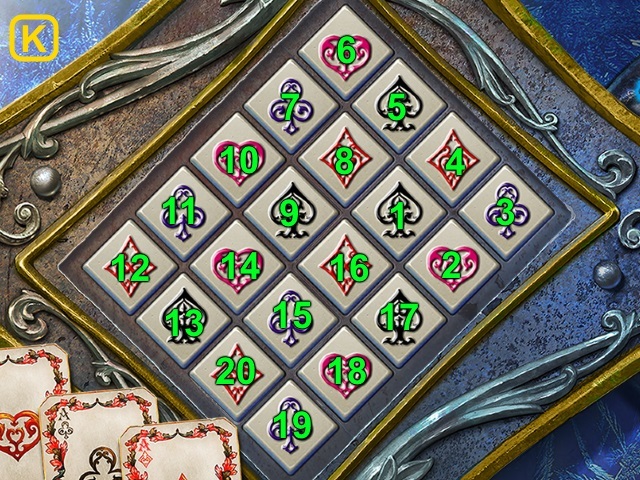 Place the PLAYING CARDS for a mini-game (J). Take the SPOOL (1/2) (L). 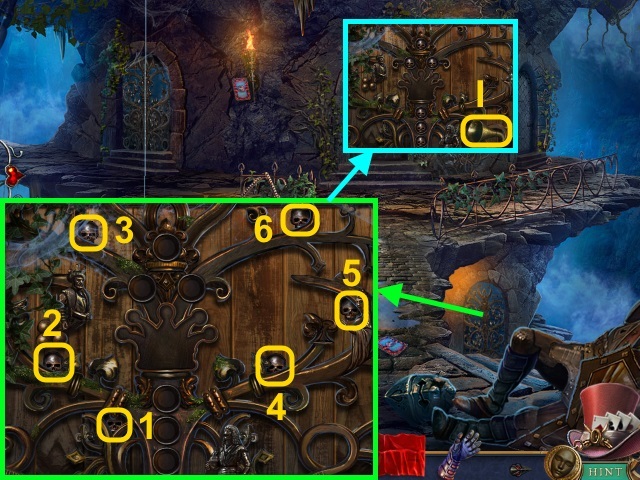 Place the DART CODE for a mini-game (M). Use the DARTS (6/6) (O); take the SPOOLS (2/2) (P). Place the SPOOLS (2/2) (Q); open the door. Move the clothes. Read the letter; take the YARN HANDLE (R). 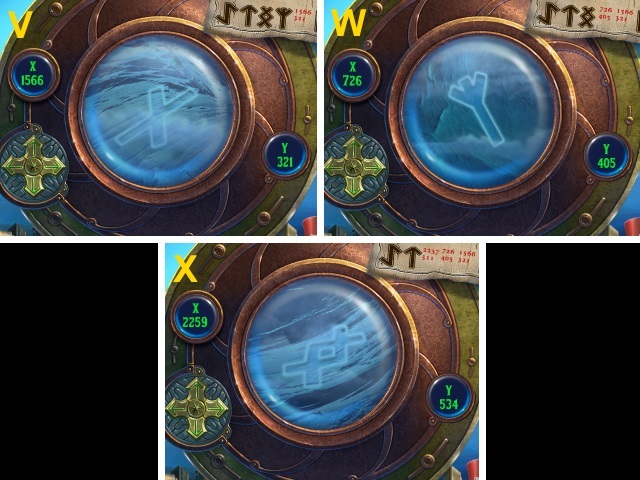 Examine the portal; use the Watch (S). 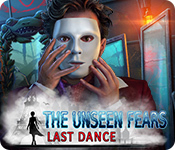 Move the skull; take the STONE MASK (U). 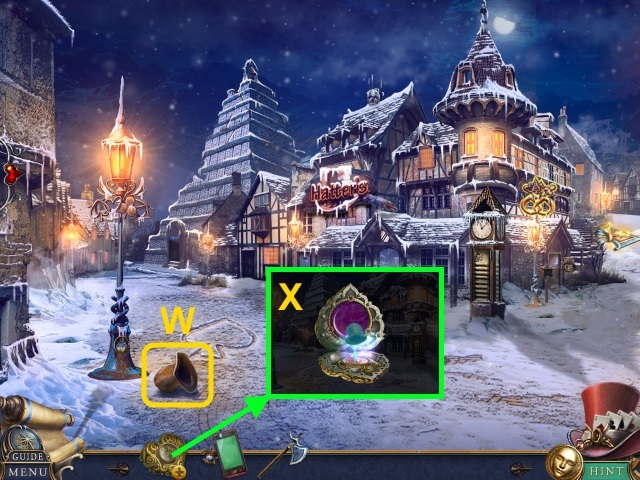 Place the STONE MASK (V); take the RINGS (2/2), GRAMOPHONE HANDLE (W), and BANDAGE (X). 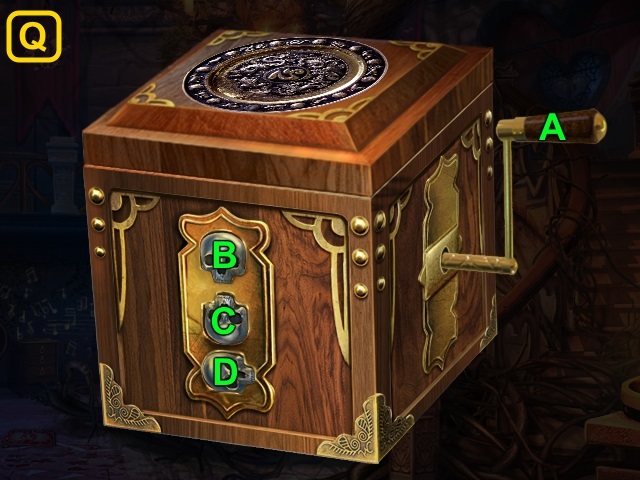 Place the RINGS (2/2) (Y); open the chest. 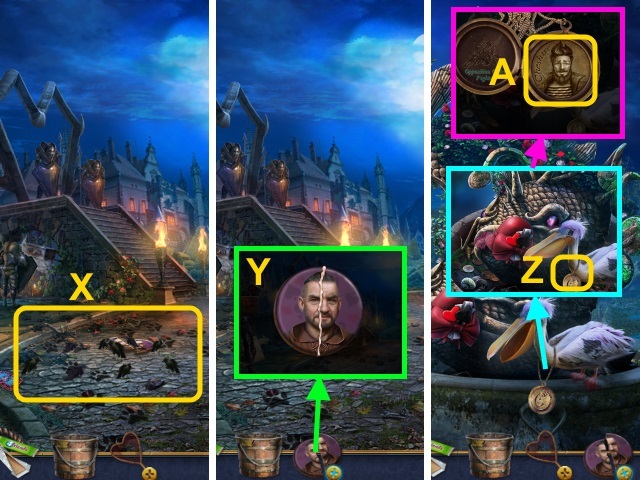 Take the SKULL TOKEN (1/3) and SHADOWS CLUE (Z). 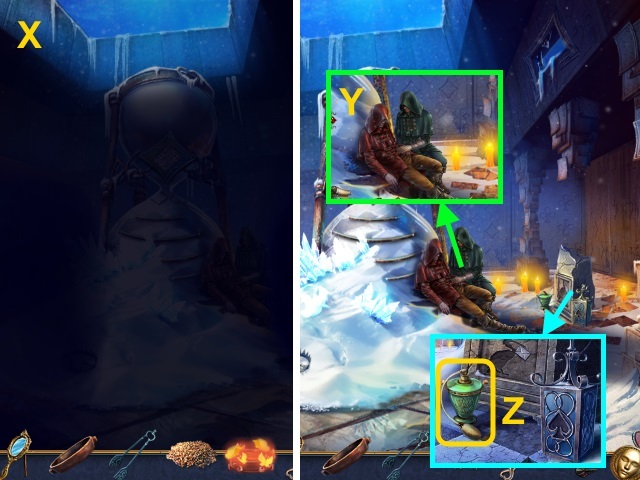 Examine the cup 2x (A); receive the WATER. 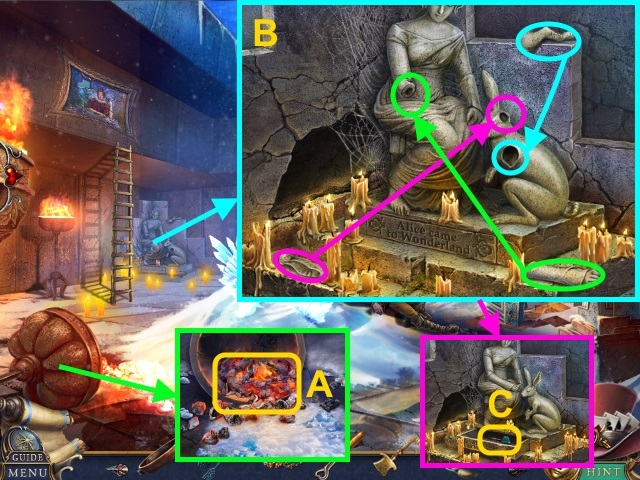 Place the ladder (B) under the statue (C). 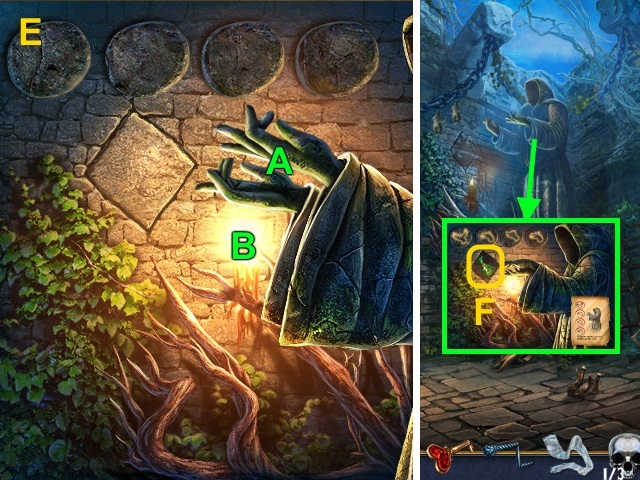 Use the LIGHTER and SHADOWS CLUE for a mini-game (D). Take the HEALING POTION (F). Use the BANDAGE and HEALING POTION; pour the water (G). 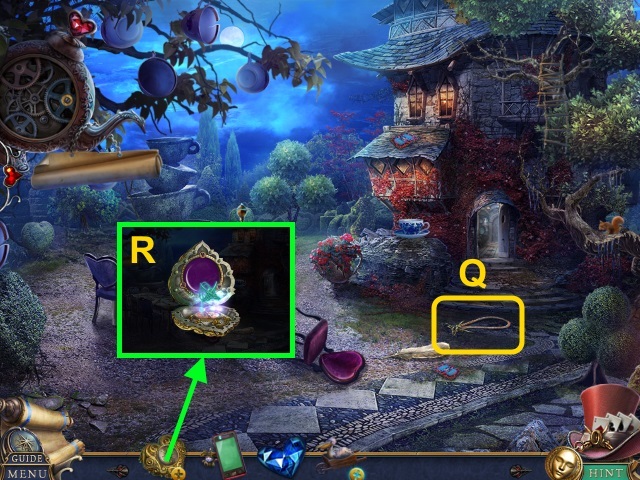 Examine the gem; use the COLLAR KEY (I). Take the HATCH KEY (J). 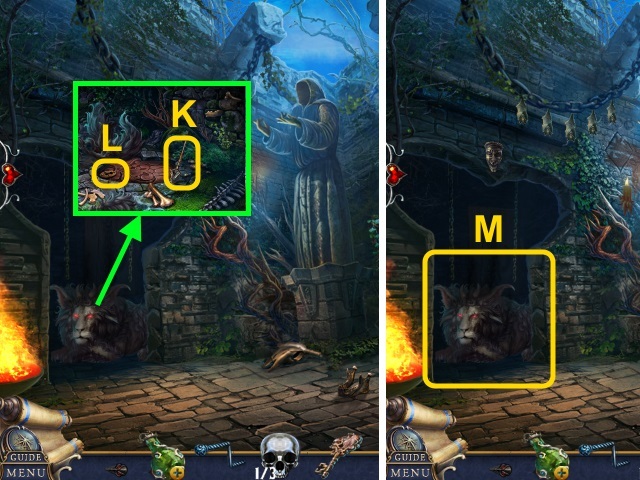 Take the BROKEN SPEAR (K); use the HATCH KEY (L). 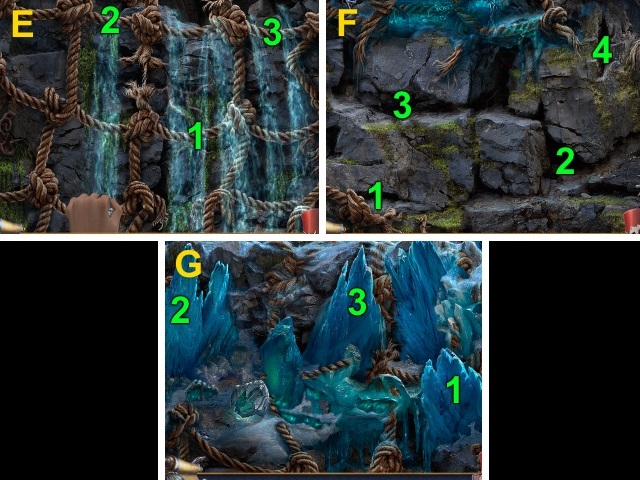 Examine the cave for a mini-game (M). 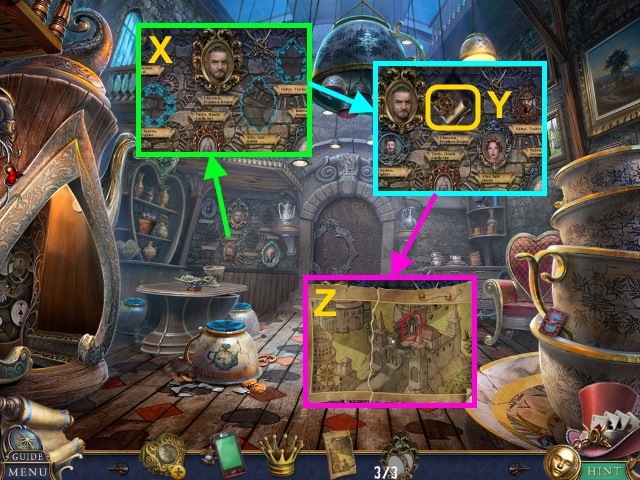 Take the SKULL TOKENS (2/3) (O). Use the BROKEN SPEAR; take the MOUSE HANDLE (P). 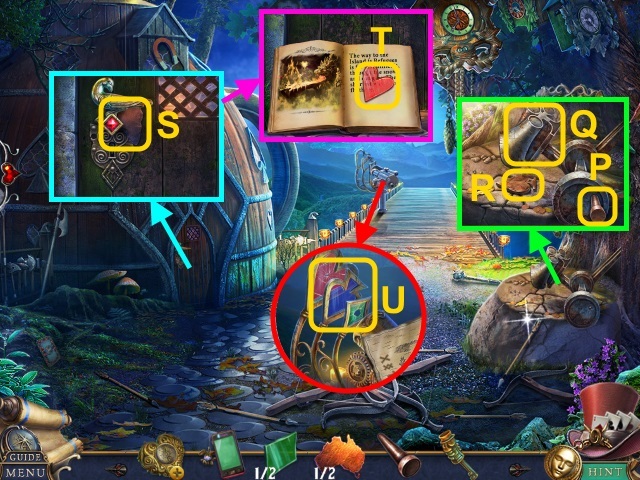 Take the DIAMOND KEY (R). 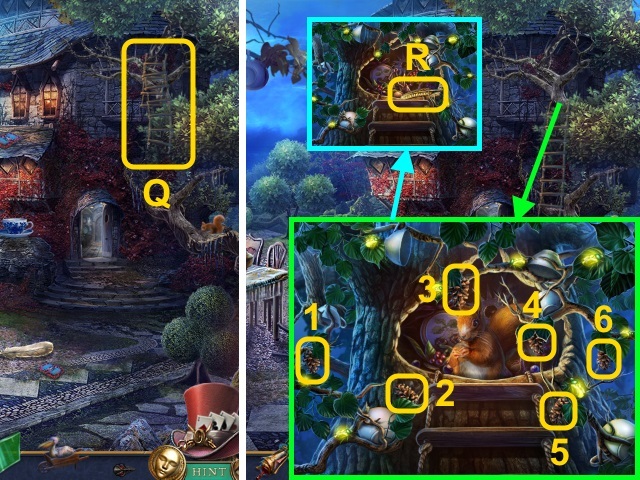 Examine the lanterns (1-3); take the SCALE WEIGHT (1/2) (S). 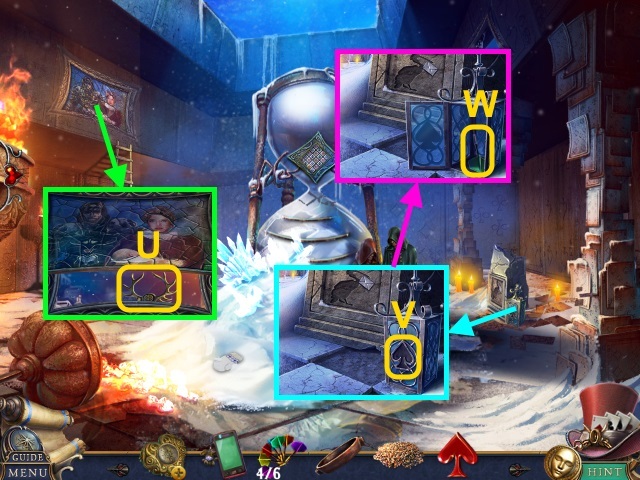 Use the DIAMOND KEY (T); take the SEAL PIECE (U). 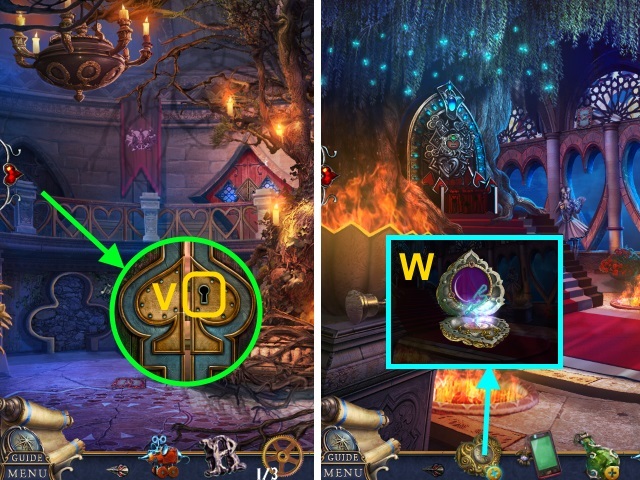 Combine the MAGICAL BOTTLE and SEAL PIECE for a mini-game (V). Take the SCALE WEIGHTS (2/2) (X). 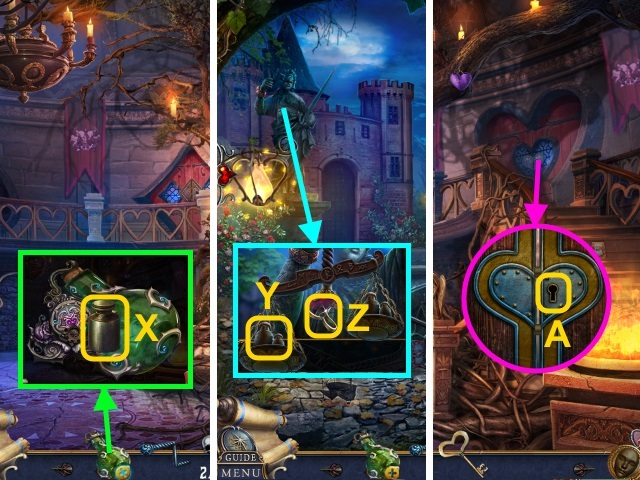 Place the SCALE WEIGHTS (2/2) (Y); take the HEART KEY (Z). 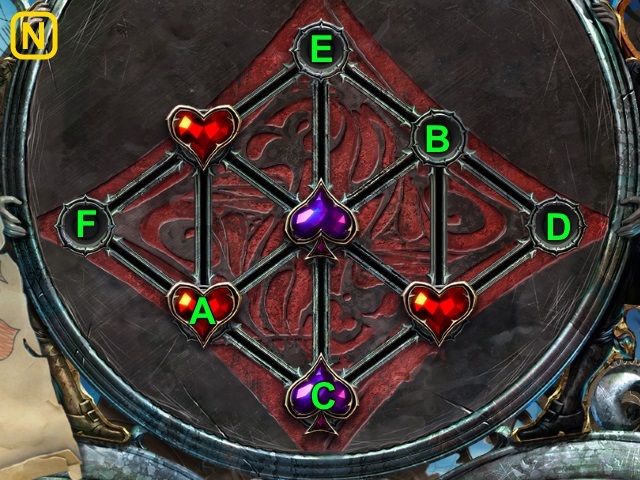 Use the HEART KEY (A). 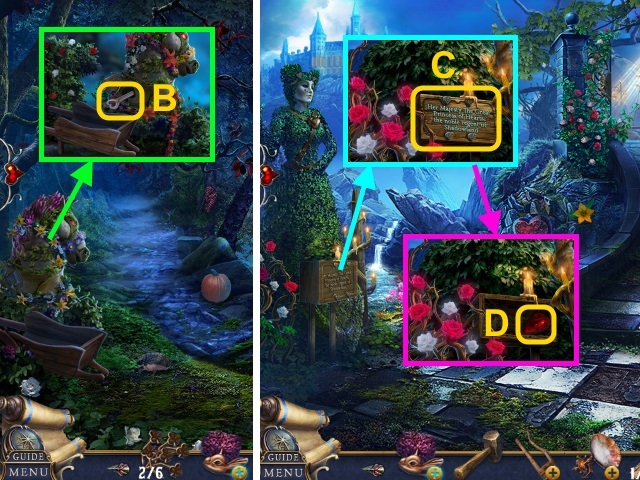 Play the HOP; receive the SKULL BOX (B). 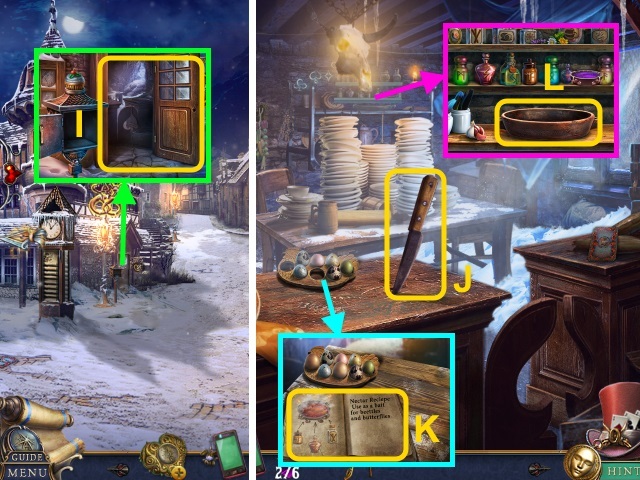 Examine the dresser for a mini-game; solution (C). 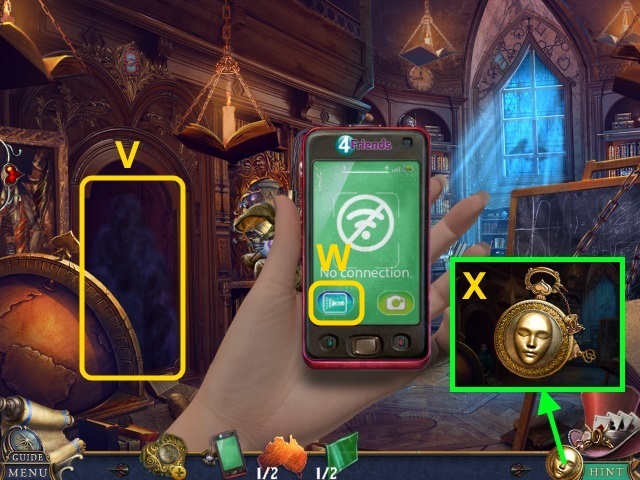 Open the drawer; take the CARD STATUETTE (2/2) (F). 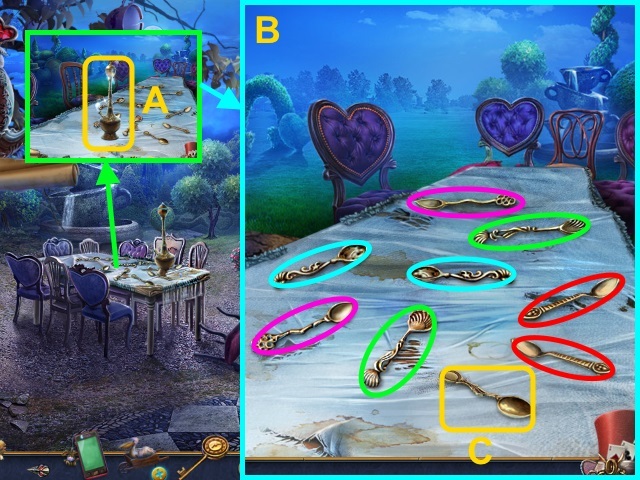 Place the MOUSE HANDLE; take the SPOON (G). Use the SPOON; take the TUBE (H). Place the GRAMOPNONE HANDLE (I) and TUBE (J); take the TEDDY BEAR (K). Give the TEDDY BEAR; take the WINDING KEY (L). 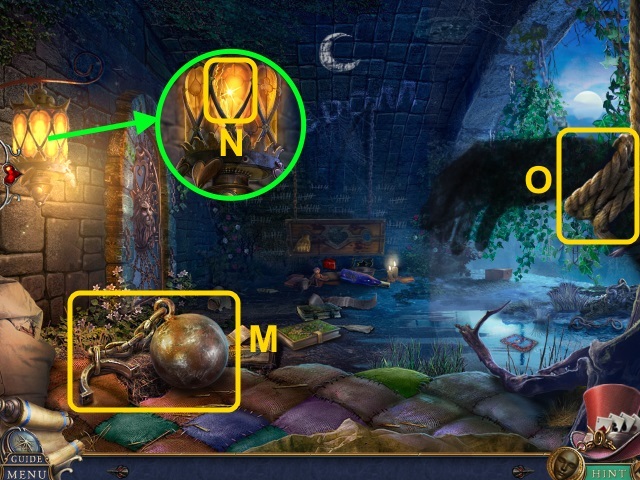 Use the TASSEL; move the curtain (M). 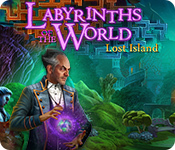 Use the WINDING KEY; examine it. Take the WIND-UP MOUSE (N). 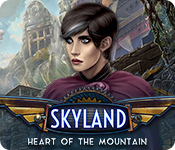 Use the WIND-UP MOUSE; take the SKULL TOKENS (3/3) (O). 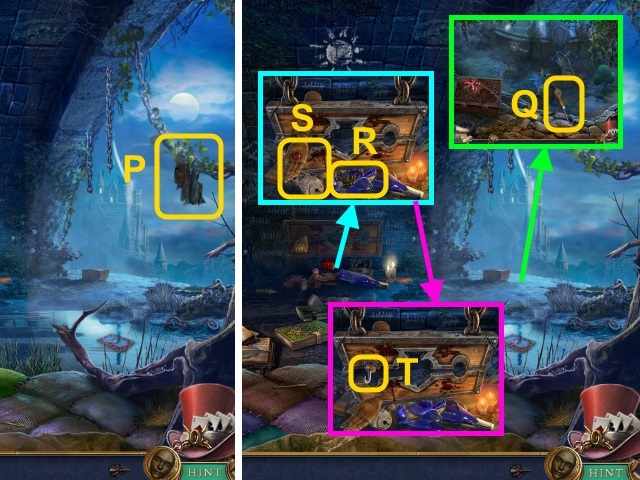 Combine the SKULL BOX and SKULL TOKENS (3/3) for a mini-game (P). 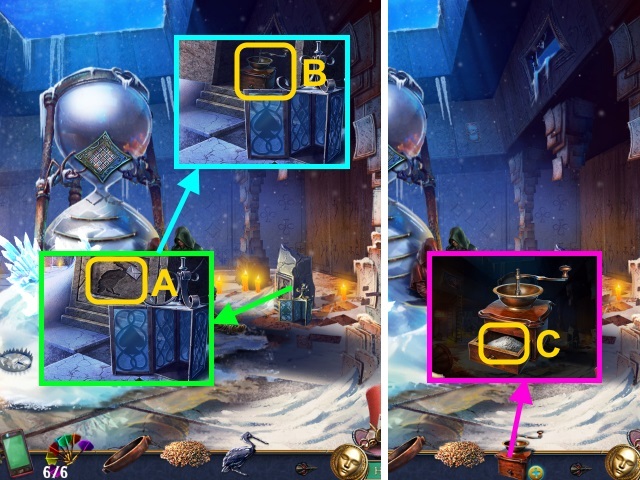 Take the BOX WITH PORTAL (R). 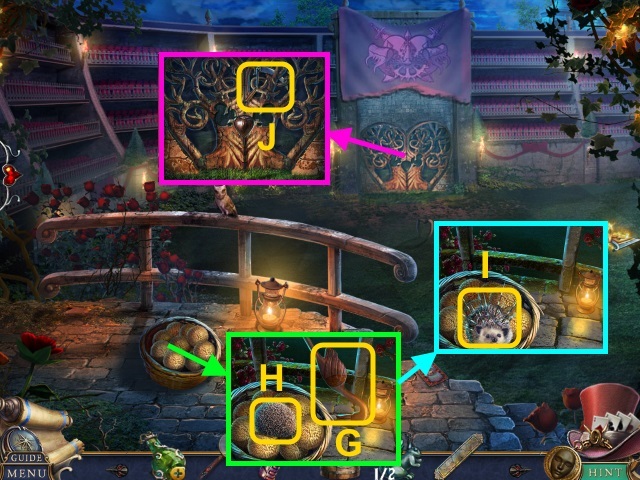 Place the BOX WITH PORTAL (S). 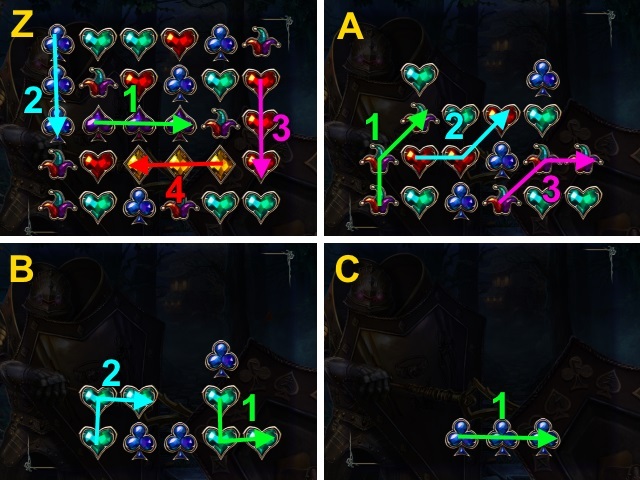 Place the YARN HANDLE (U); take the SWORD EMBLEM (V). 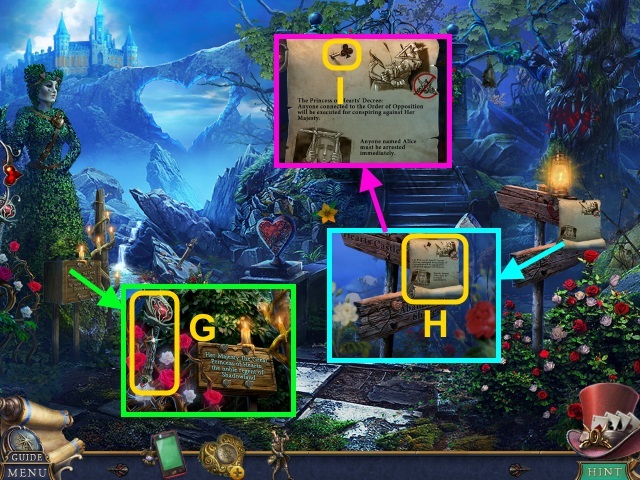 Play the HOP; receive the CARD STATUETTES (2/2) (W). Move the pillows; use the WIND-UP MOUSE. Take the METAL SHOE (X). 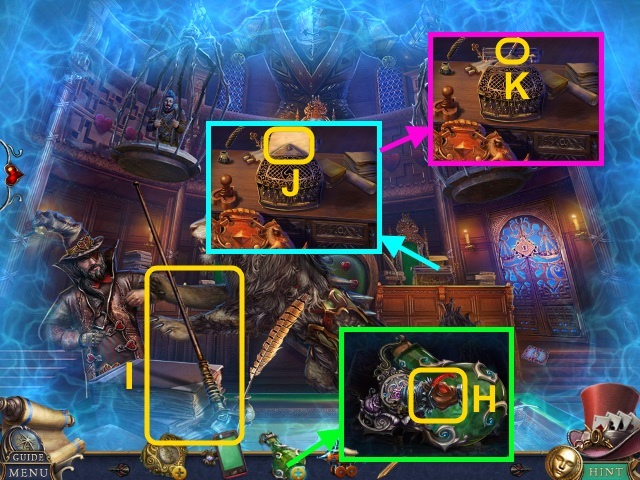 Examine the boards for a mini-game (Y). 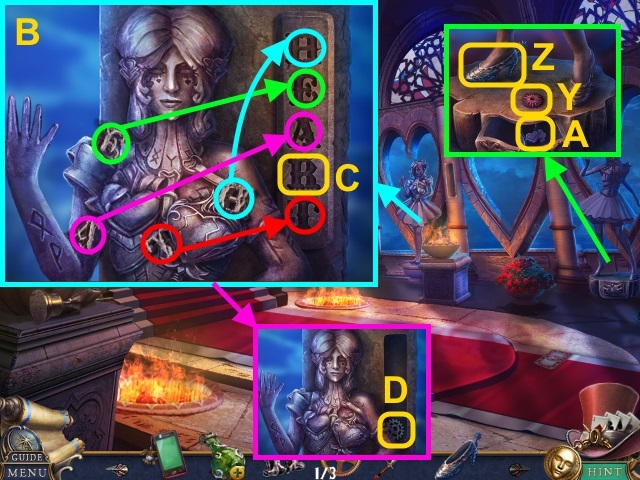 Place the CARD STATUETTES (2/2); take the COURTROOM KEY (B). 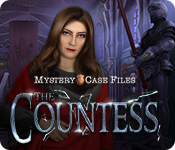 Use the COURTROOM KEY (C). Walk left for a mini-game. Take the SEAL PIECE (E). 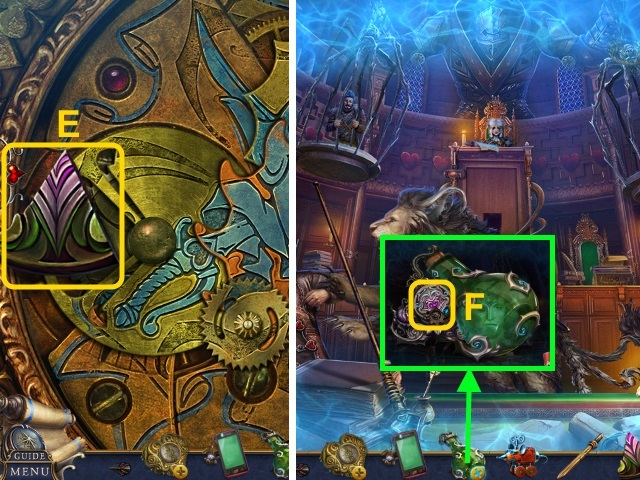 Combine the MAGICAL BOTTLE and SEAL PIECE for a mini-game (F). Take the BROKEN PEPPERMILL (H). Take the PIPETTE WITH OIL (K). Use the PIPETTE WITH OIL; take the WALKING STICK (L). Use the WALKING STICK (N). Open the pouch; take the METAL LETTER and CORK (O). Place the CORK (P); open the drawer. Take the GEAR (1/3) and HANDLE (Q). Combine the BROKEN PEPPERMILL and HANDLE (R); take the PEPPERMILL. Use the PEPPERMILL; receive the SPADE KEY (S). Place the SWORD EMBLEM; take the SWORD (T). Use the SWORD; take the HATTER’S CHAIN (U). Use the SPADE KEY (V). 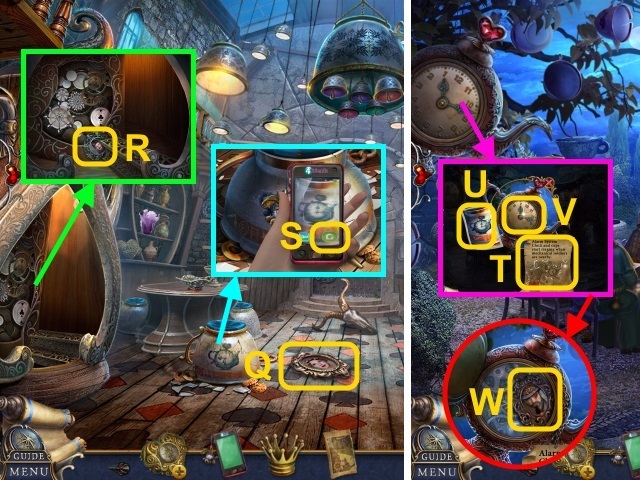 Combine the SEARCHING COMPASS and HATTER’S CHAIN for a mini-game (W). Take the GEARS (2/3) (Y); place the METAL SHOE (Z). 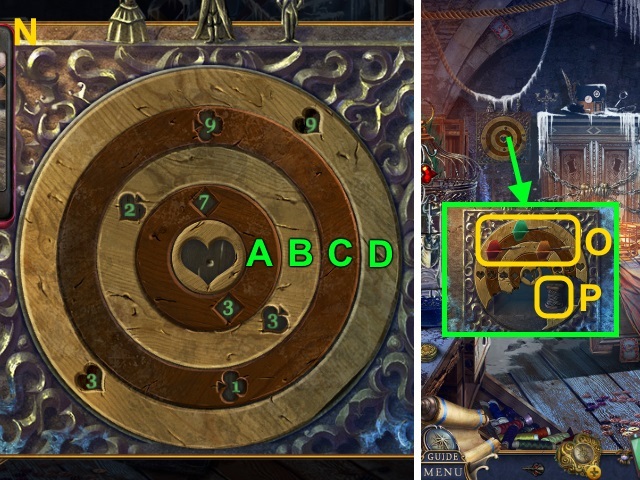 Place the letters (B); place the METAL LETTER (C). Take the GEARS (3/3) (D). 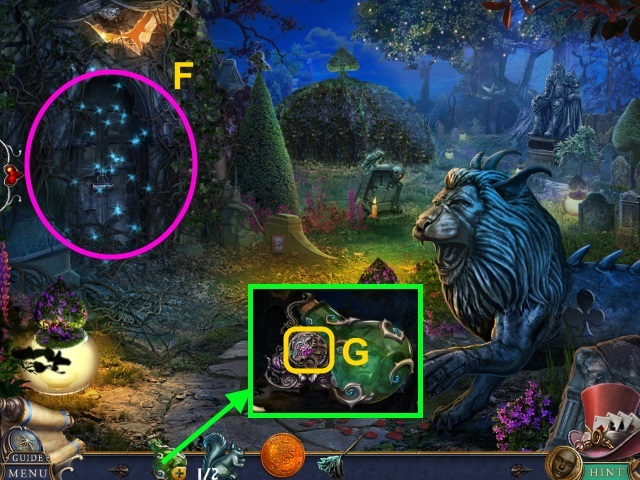 Place the BRACELET (E); examine the heart (F). 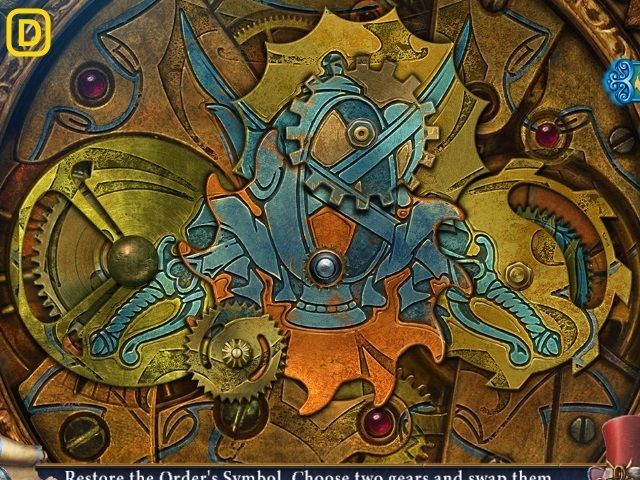 Place the GEARS (3/3); read the letter (G). 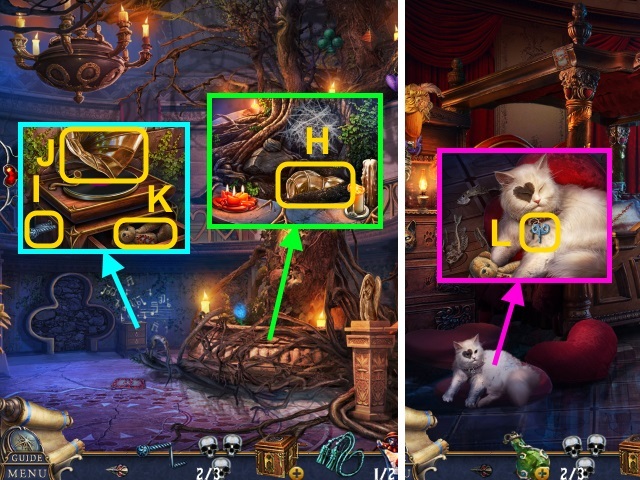 Take the THRONE KEY (H). 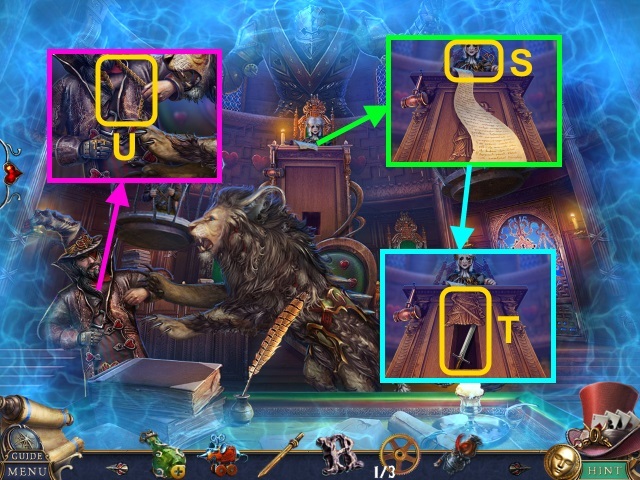 Use the THRONE KEY (I). Take the SEAL PIECE (J). 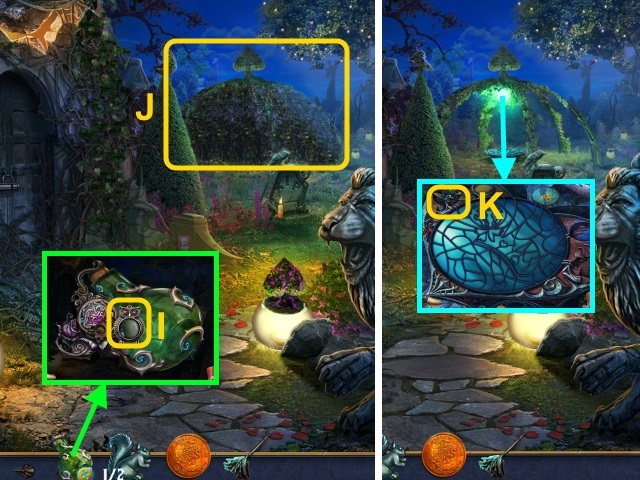 Combine the MAGICAL BOTTLE and SEAL PIECE (K). 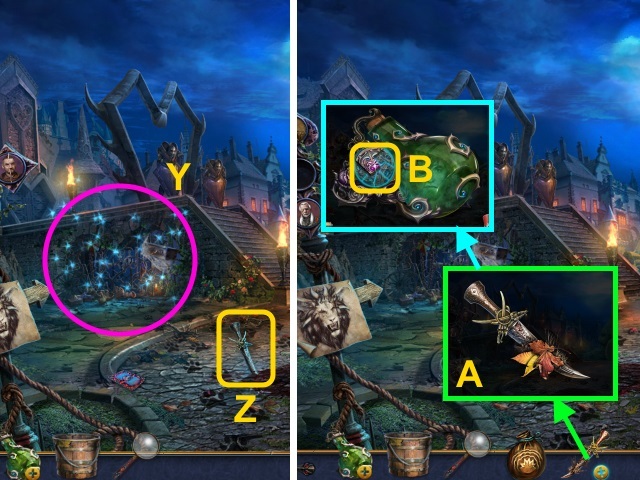 Use the SWORD for a mini-game (L).